Battery Dance conducted a performance at Dragao do Mar that was highlighted by an innovative artistic collaboration with visiting Iowa poets, which saw Battery’s dancers improvise dance to poetry read aloud. 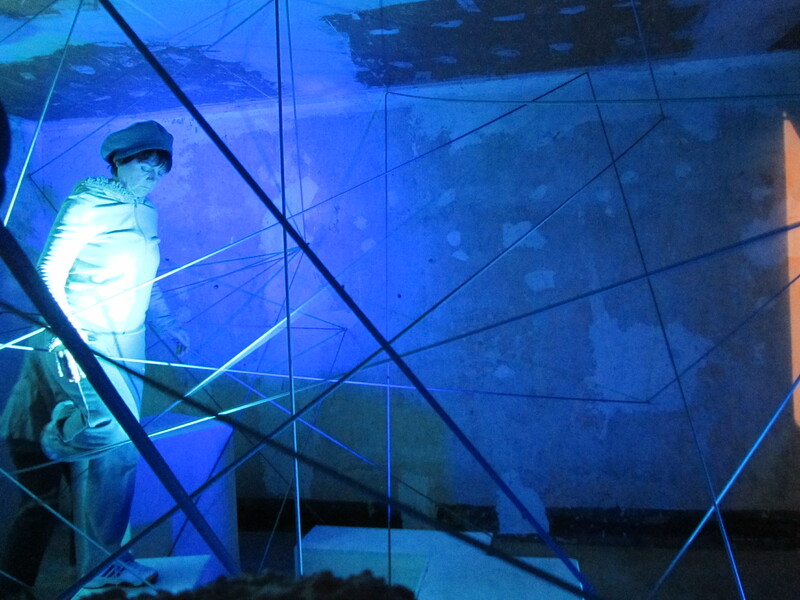 While the performance occurred, the poetry translation was projected on a white wall of the building and some of the dancers incorporated the surrounding architecture into their dance. This resulted in audience that continuously grew over the course of the hour as passers-by and pedestrians stopped on the bridge, stairwell, an surrounding plaza to watch the performance form multiple angles. The performance was then featured on the most widely watched morning show in the state. Do not be conservative in your performance- push the boundaries of what you can do, and greater interest will follow. Unlike Belem, local partners in Fortaleza were fewer and not as well funded. As a result, workshop venues were good but not great in the city. 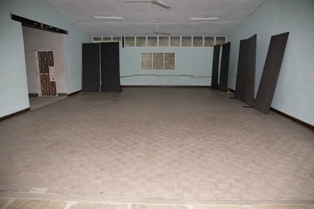 Marley matting was very old and sometimes laid on concrete and some venues were too small. If possible, try to understand your local partners’ budget range and equipment inventory so to know what their capacity is. Also be sure to get pictures of venues prior to your arrival in-country so you do not need to improvise on the ground. Similar to Belem, Fortaleza is a city ruled by contracts and contracted responsibilities. 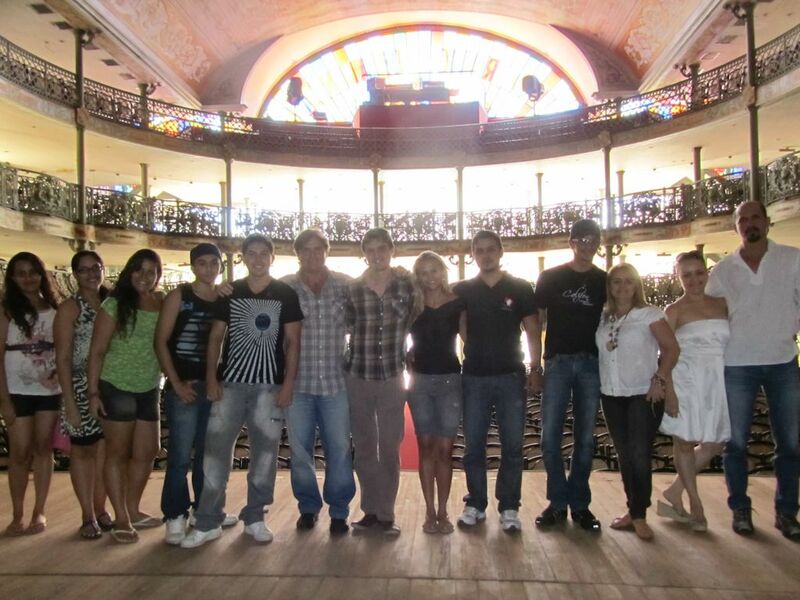 In the Theatro Jose de Alencar, the technical crew is bounded to only work within the constraints of their contract. For our program, this meant that they could not touch equipment (the backdrop) that was installed by an external company. Understand the local work culture at the beginning of your program and be prepared to call on those who are contractually responsible for troubleshooting. A half hour prior to performance start, and local theatre staff, responsible for taking tickets, handing out programs, and directing audience were no-where to be seen. 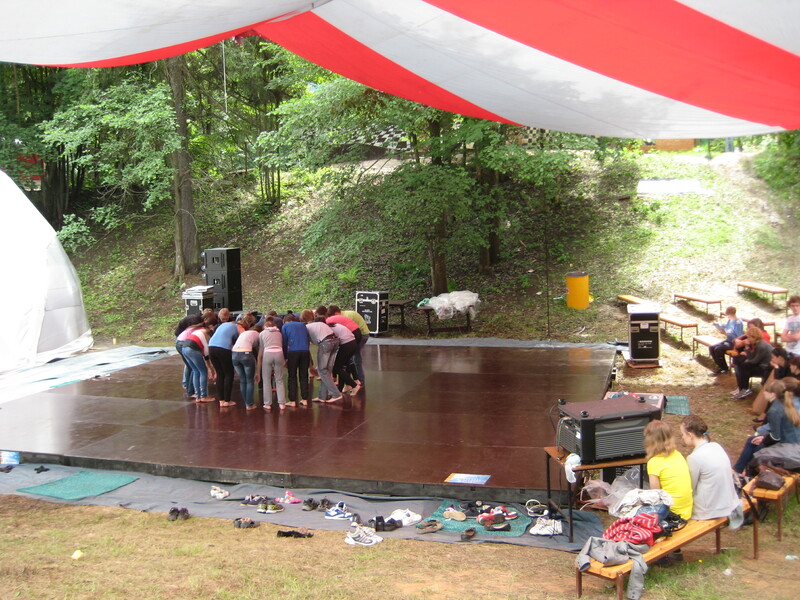 Usually, theater staffs have their own set of procedures on what to do prior to a performance. This was apparently not the case, and resulted in program managers and local host staff handling those duties at the start. In negotiations with the local theatre manager, be sure to include a schedule and detail of where staff should be, what duties they should undertake, and when. Do not assume that local procedures are setup. The State Government of Ceara provided very generous and comprehensive support for the program in Fortaleza: A large van was provided and dedicated to the Company throughout its stay; Carla Tauscheckt from the State Government acted as BDC’s official city guide; and hotel accommodations were provided for the entire Company. Unlike the previous programs in the tour, workshop groups in Fortaleza were organized with one main local partner: BCAD, a non-profit organization that works to assist the most disadvantaged communities in Fortaleza. 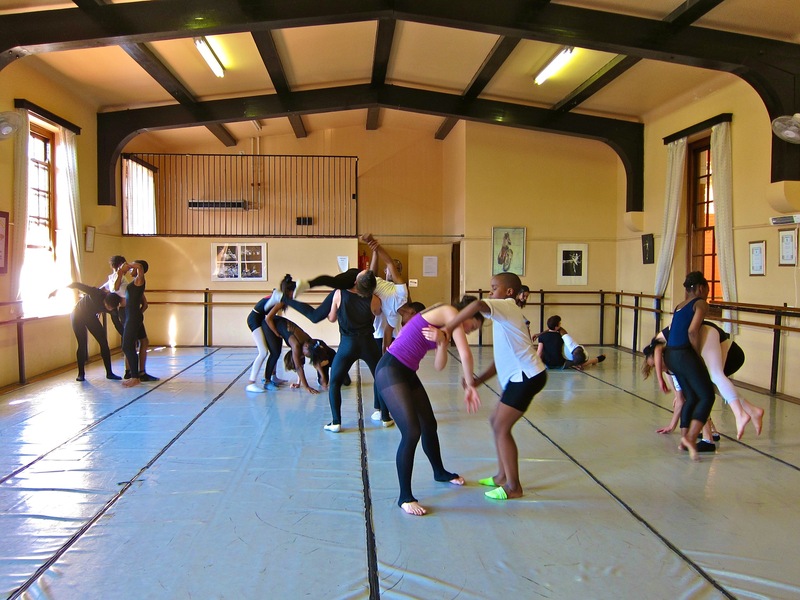 BCAD hosted 3 workshop groups at two locations, while another local partner closely associated with BCAD, Ballet Lucymeire Aires, hosted two workshop groups at one location. Each workshop venue location presented a structural problem. 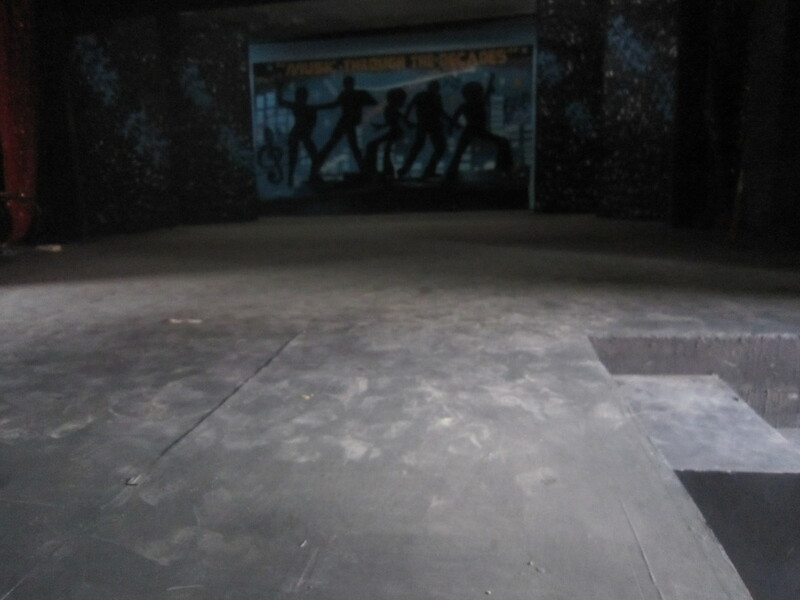 The floor in the three larger venues was problematic – in one case, it was laid directly on top of concrete; in the other, an old dance mat (Marley) was so thin that it folded and twisted as dancers turned or pivoted. The other two venues had excellent flooring but were too small for the workshop groups. 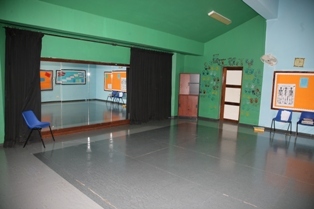 Understanding that this was a result of local limitations, the BDC teaching artists accommodated and worked together to alternate rooms. Five Dancing to Connect groups held workshops for 4 hours per day for 5 days with approximately 18 students in each group. 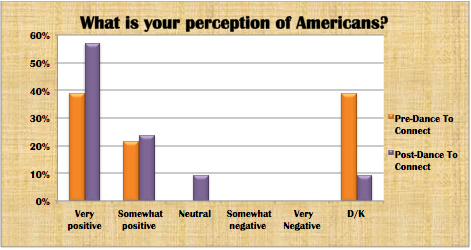 Participants were low-income disadvantaged youth and young adults. Melanie Brooks, a Senior English Language Fellow with IFCE/IBEU, coordinated all of BDC’s translation needs for the program. Once again, the translators were essential to the success of the program, and Melanie was able to coordinate teams of two to three translators dedicated to each teaching artist. The Dragão do Mar performance on Wednesday May 16 coalesced around an innovative artistic collaboration which saw Battery Dance Company’s dancers creating choreography in response to poetry read by the American poets, who were also visiting Fortaleza as a part of a separate ECA-funded program. 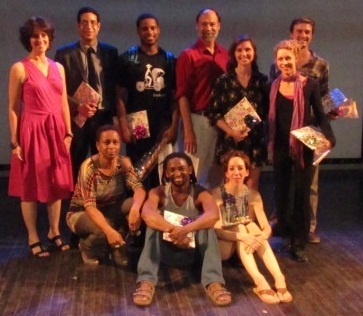 The collaboration with the American poets from the Iowa writing program was the brain-child of BDC’s Artistic Director Jonathan Hollander, Embassy Brazilia’s IRO Carol Brey-Casiano, and Consulate Recife’s PAO Heidi Arola. While the original plan called for each dancer to be paired with a poet, two of the visiting poets were unable to obtain visas in time, leaving Sean and Robin without partners. Production designer Barry Steele projected translations of the poetry onto the side of a building while the dancers made use of the surrounding architecture around the stage for their performances. In the second part of the performance, BDC performed an excerpt of ‘Perceptual Motion’, a series of three duets that showcased the artistry of the Company. 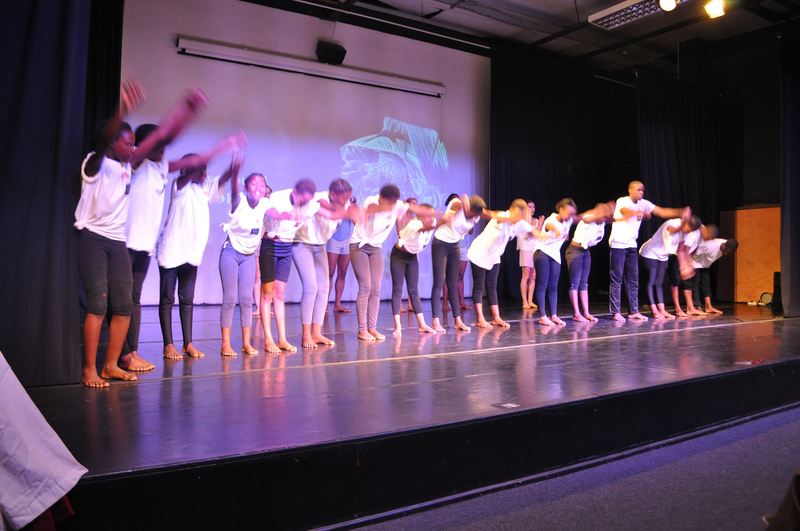 The event was rather sparsely attended compared to BDC’s other performances but the inclusion of print media and television coverage amplified the impact. ‘Bom Dia’ Ceara, the State’s most widely viewed morning show, carried a feature on BDC and the poetry/dance event the next morning. FSN Edvaldo Amorim was a great asset: he was able to secure a private dressing room for the dancers at the location, acted as MC for the program, and at one point requested that nearby businesses turn down their music volume so to not disturb the performance. 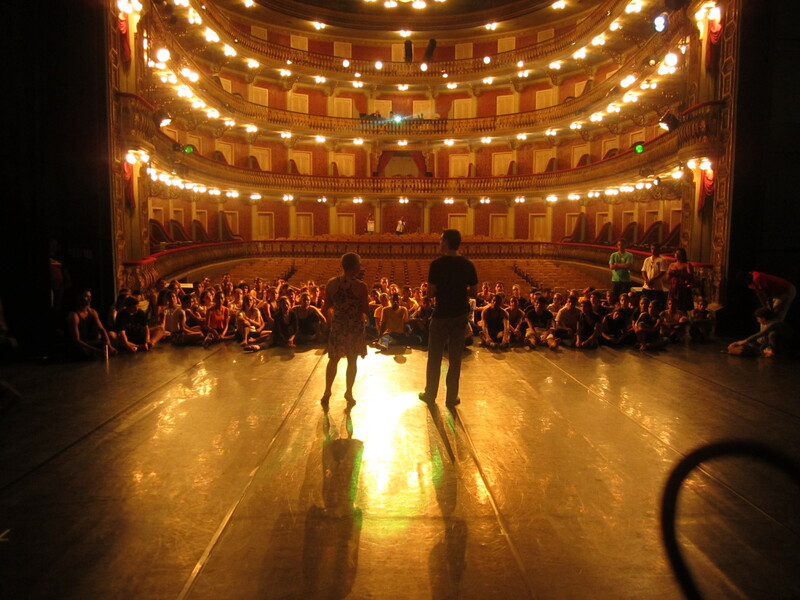 Barry Steele presented two technical workshops at the Jose de Alencar theatre attended by approximately 30 theater technicians and designers. 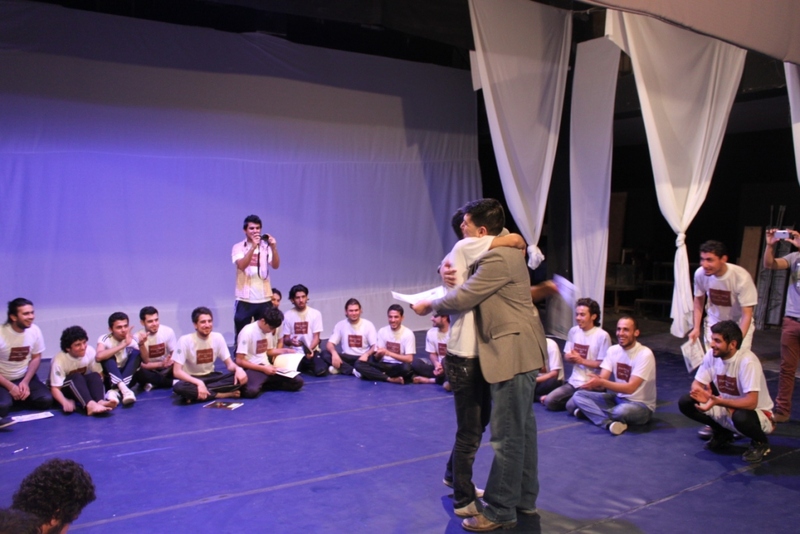 Andres, the technical manager on loan from BCAD, provided translation for the workshops and was key to Barry’s negotiation of the production schedule with the manager of the theatre. 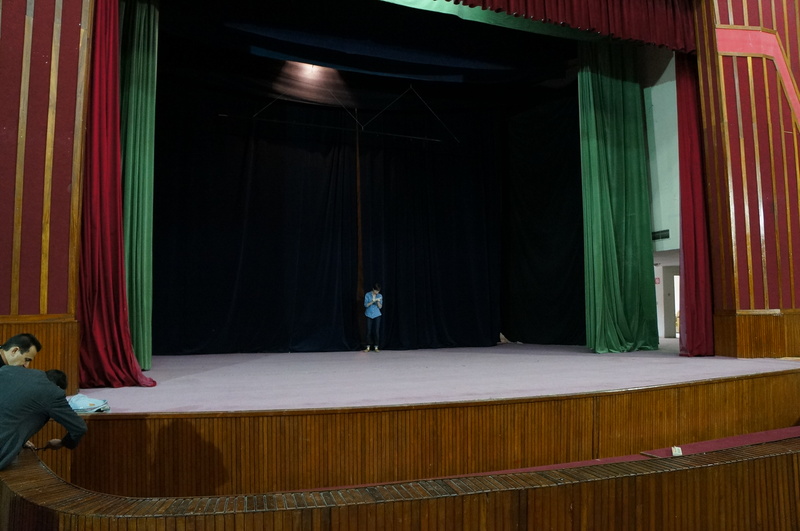 Andres, an extremely knowledgeable stage technician and excellent translator was of tremendous help to Barry up until 2 days prior to Barry and his technical trainees at the Theatro Jose de Alencar performance, when, without notice, he disappeared. 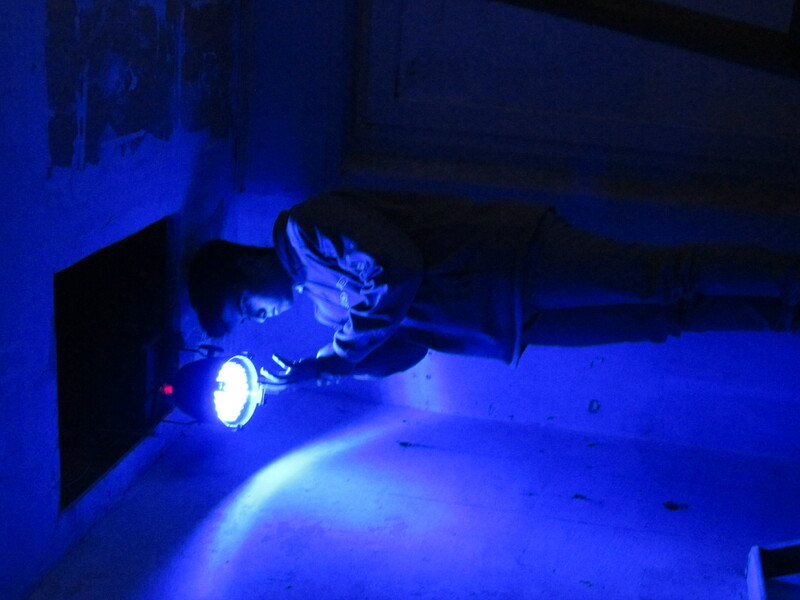 In his place, FSN Edvaldo Amorim took over essential communication between Barry and the local theatre technical crew helping to prepare for and carry out the final performance. 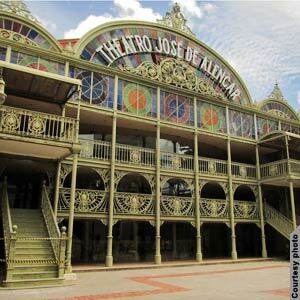 Tickets for the final performance, held at the Art Nouveau Theatro Jose de Alencar, were all claimed within 5 hours. The performance was attended by U.S. Principal Officer Usha Pitts, who gave opening remarks and presented local partner Janne Ruth with flowers at the end of the performance. FSN Edvaldo Amorim acted as MC and managed to secure a speaker’s podium from the Brazilian Army Ministry before the show. The audience responded to the show with thunderous applause and cheers, at one point expressing their approval in the middle of Sean’s group piece, and at other times shushing the workshop students who continuously screamed out their teaching artist’s name as the BDC dancers performed ‘Perceptual Motion’. 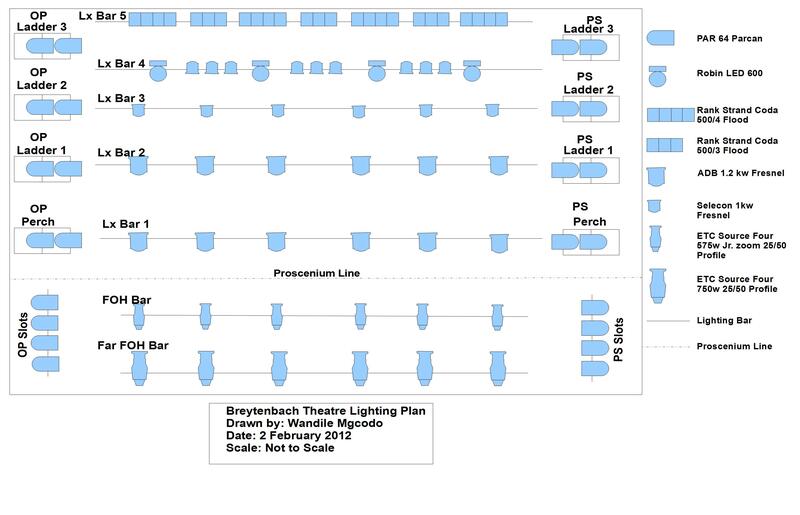 Resource: Technical specifications for the theater. Parmaribo, Suriname is an extremely diverse ethnic and religious city where many different types of people live together peacefully. Despite high education and employment, infrastructure remains extremely poor with the tallest building only 6 stories tall. 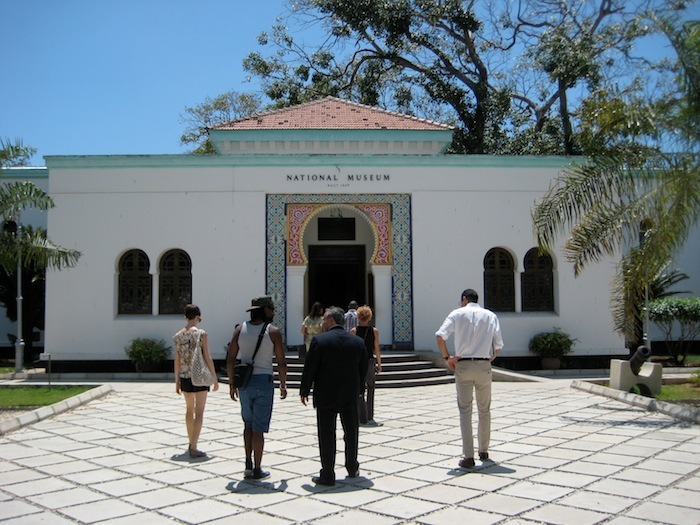 As in many locations throughout the world, the arts community in Suriname is very small and all arts administrators know one another. Due to the size, there is rivalry between local arts organizations as they compete for the brightest teachers and managers. 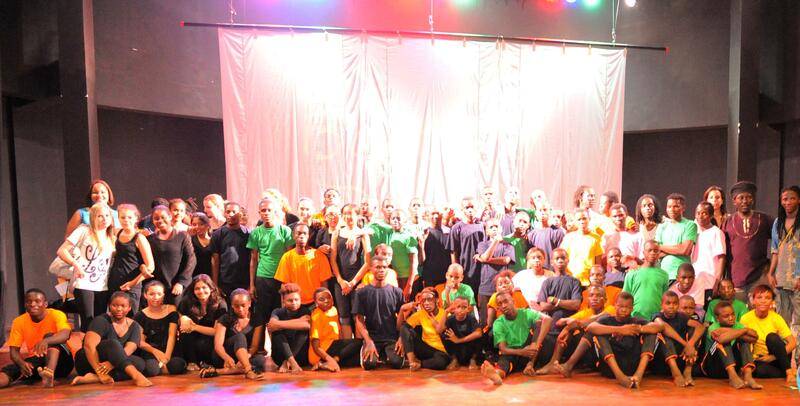 In our program in Paramaribo, we worked with the leading arts organizations in the city. Prior disagreements before our arrival in-country, created disagreements over the program and rules once in-country. In cities where you work with a multitude of partners it is best to understand how those partners get along prior to arrival in-country. Once in-country, a meeting with all local partners should be held, before program work begins, so that concerns are alleviated and the rules are understood by all. Many times, you will have to take the lead in assuaging and directing local partners as your local host may not want to appear heavy handed and authoritarian. In Paramaribo, all concerns were alleviated once face to face discussions occurred. The system of drainage put in place by the Dutch before colonization ended consists of open air canals throughout the city that regularly get clogged with trash, leaving trenches of sitting water that breed mosquitos day and night. While we were in-country, the risk of Malaria and Dengue was low. However, be sure to consult the CDC’s health travel advisory well before departure and also know the local mosquito threat so to understand, not only your need for repellant, but how much an audience can bare waiting outdoors prior to performance start and whether an air conditioned venue is necessary. 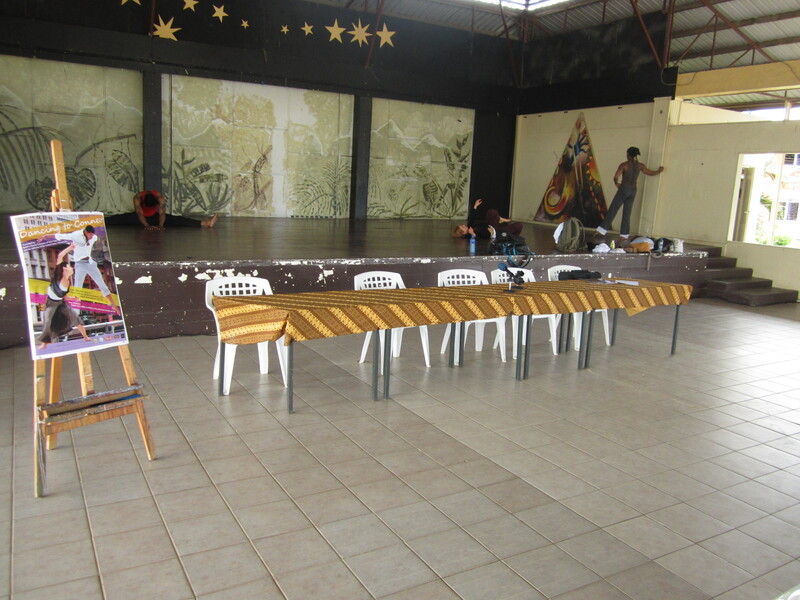 In Paramaribo, our performance venue was the un-air-conditioned Cultural Center Suriname. Luckily for our performance, the mosquitoes were driven away by a midafternoon and early evening rainfall. 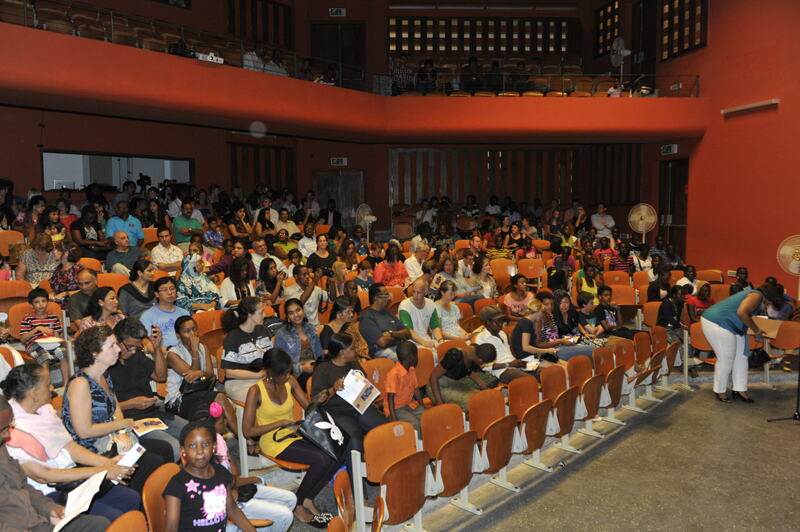 Our performance at the Cultural Center Suriname had a capacity of only 350 people. Due to extremely high demand for our final performance, we decided to add an additional performance earlier in the afternoon at 5pm which also ‘sold’ out. For venues with low seating capacity, be sure to leave enough room in your schedule for additional performances if necessary. 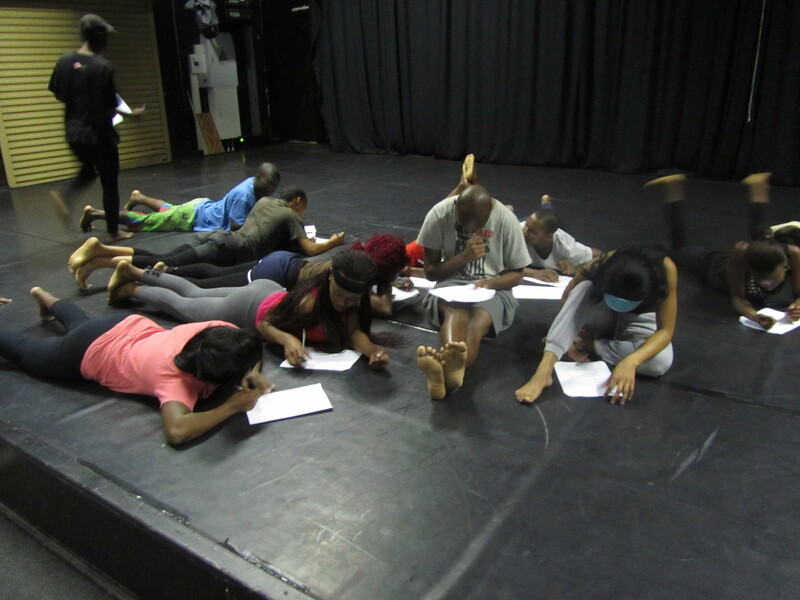 Mixed gender Dancing to Connect (DtC) workshops were held for 5 hours per day for 4 days and included participants from different ethnic groups and from various socio-economic backgrounds. Although 80 participants had been selected prior to the workshop, a number of low-income participants were unable to juggle the time required with other commitments such as school and multiple job positions. Despite this, there was still an even mix of low-income/high-income students. 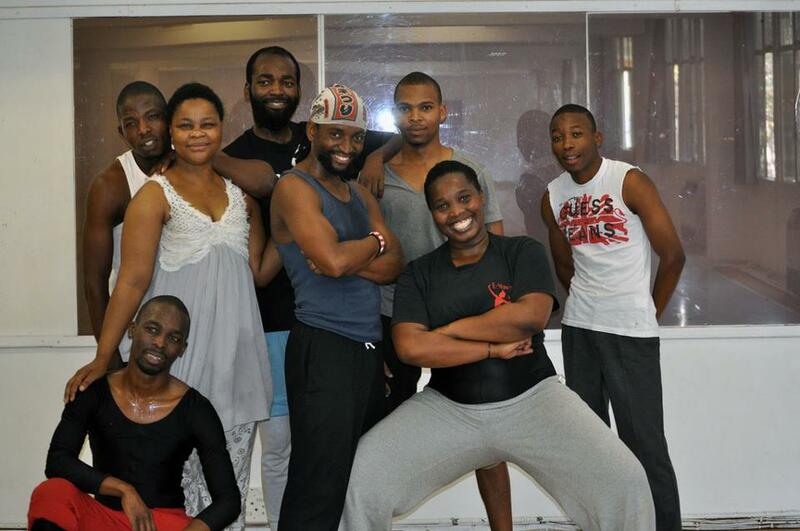 Bafana Matea led one mixed workshop group at NAKS, Mira Cook led another group at Marlene’s Ballet. Due to a low number of participants in one of the two planned workshop groups at the venue Sana Budaya, the two groups were combined into one and jointly led by Sean Scantlebury and Robin Cantrell. Battery Dance teaching artist Carmen Nicole held two 1.5 hour workshops at Kennedy High School for the Deaf, NATIN High School, Mulo Ellen High School, and one workshop at the International Academy of Suriname (IAS). With the help of local partner Moira Morroy’s Movement studio, a dance education organization that works with disabled children, Carmen worked with deaf youth at Kennedy High School. During the first day, school teachers and Dutch summer interns joined together with the students to participate in the workshop. In the second workshop, Carmen, working with older deaf students, was able to have the students create their own 3-minute choreography in the short time with the help of a sign language interpreter. Also on the second day, television media including Youth Journal and Apintie Television interviewed Carmen, Emad, and participants. Over two days, workshops at the Kennedy School were held with 40 youth and 9 local teachers/interns. 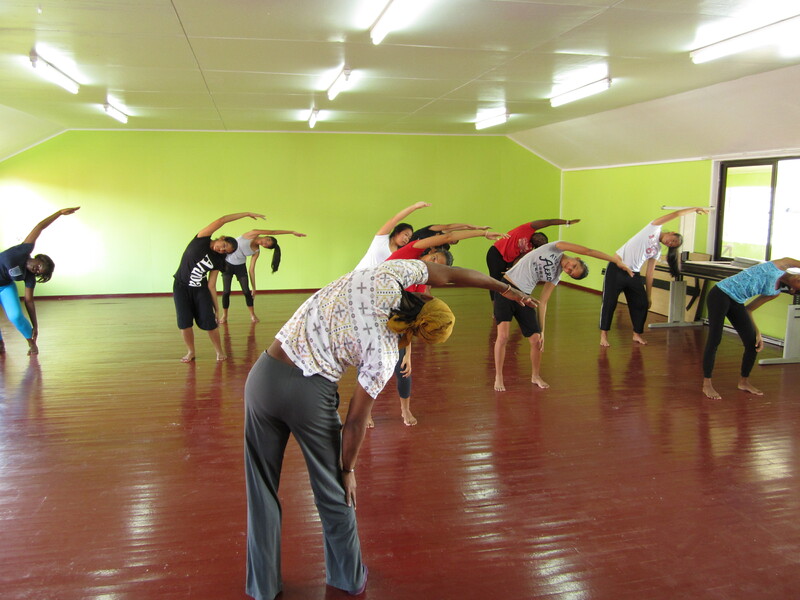 At the Mulo Ellen School, located in the rural outskirts of Paramaribo, students had not been exposed to an American dancer before nor participated in a dance program. Having never been exposed to a person like Carmen before coupled with the lack of music due to a lack of electricity in the gymnasium, the students were mostly giggles on the first day. 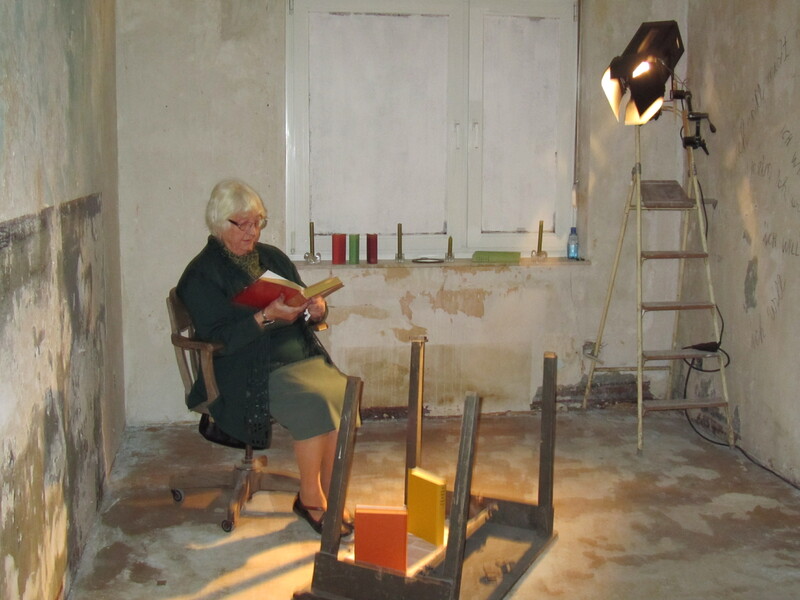 On the second day, Carmen was prepared with battery operated speakers and a new plan on how to work with the students. Over two days, workshops were held with a total of 50 youth. At NATIN technical school, Carmen held 2 workshops on the same day with a total of 70 students. 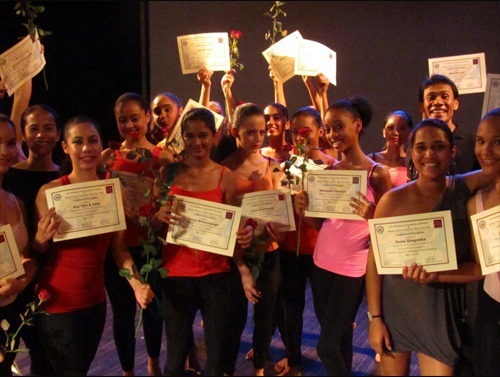 At the International Academy of Suriname, one workshop was held with 15 children who also displayed the choreography they were preparing for the upcoming show. 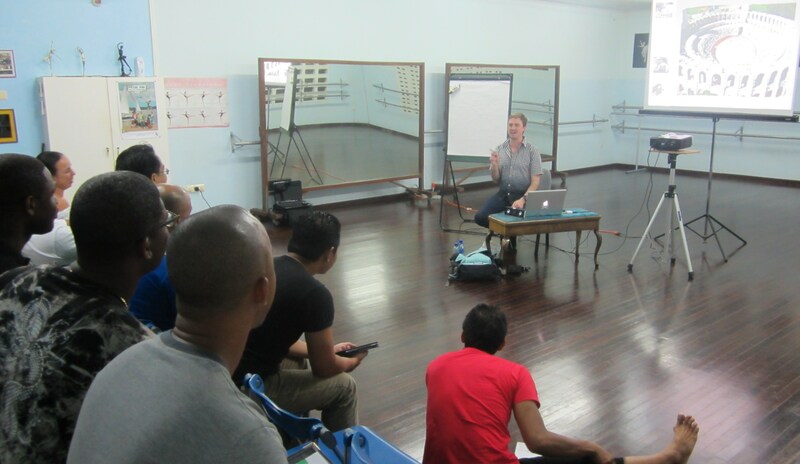 BDC’s Production Designer Barry Steele held two technical workshops at Marlene’s Ballet studio. Attendees to the workshops included technicians, arts administrators, television crews, and local Embassy technicians, who provided technical support to Barry throughout the program. 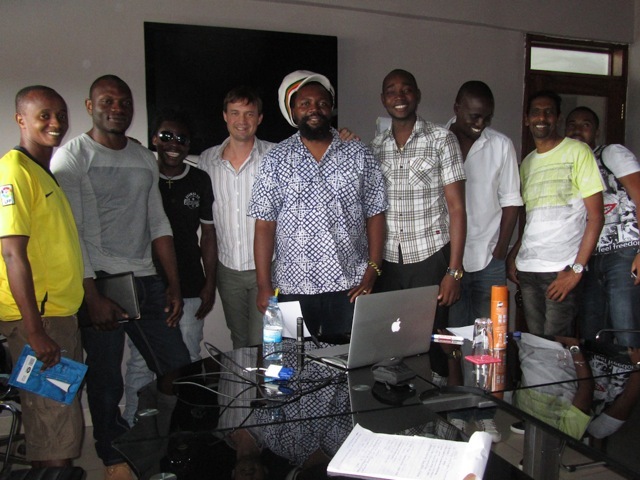 At the conclusion of the first workshop,representatives from Apintie television were so impressed and eager to learn that they requested a follow-up technical workshop to take place at their television and radio station, which Barry agreed to. Total number of participants at Barry’s technical workshops was 35. 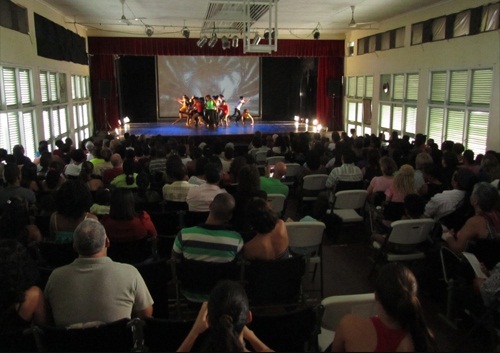 Due to the extensive media coverage surrounding BDC’s workshops in Suriname, all tickets for the final 8:00pm performance at the Cultural Center Suriname, a venue with capacity of 350 persons, were claimed in less than two hours. Additional seats were added in the aisles and in a balcony section, leaving no room to spare. However, due to the overwhelming demand for tickets, the Company agreed to conduct an earlier performance at 5pm. All tickets for the earlier performance were again claimed within a few hours’ time. The audiences for both performances expressed their approval enthusiastically, sometimes yelling out in approval during the performance, and afterwards sought out BDC members and Embassy staff to express their gratitude for conducting the program in Suriname. The 8pm performance was videotaped by Apintie television. 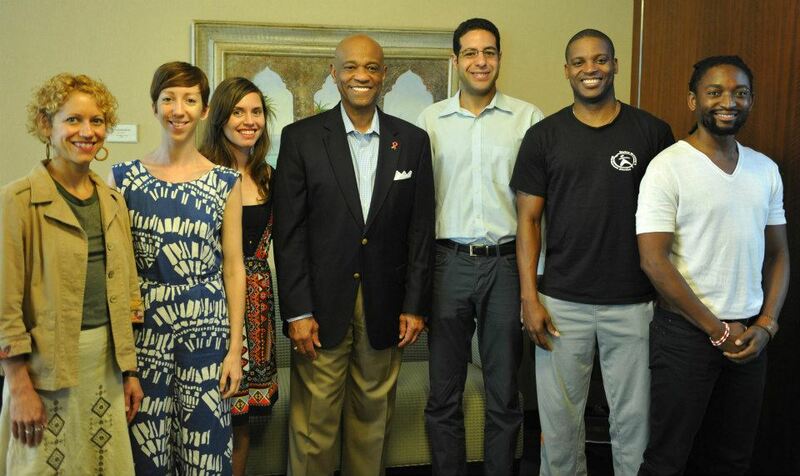 During BDC’s last day in country, Deputy Director Emad Salem and Carmen Nicole held a roundtable discussion with local arts administrators. The meeting was attended by Dweight Warsodikromo of Sana Budaya, Marlene Lie a Ling of Marlene’s Ballet, and two teacher-trainees. Prior to the meeting, three of the four in attendance were separately developing plans for a large arts and culture complex to be located in Paramaribo. After discussing international funding opportunities and strategies for financial sustainability, the local arts partners realized the need to present a unified front. They jointly agreed to come together under a previously defunct collective arts organization for the benefit of all. 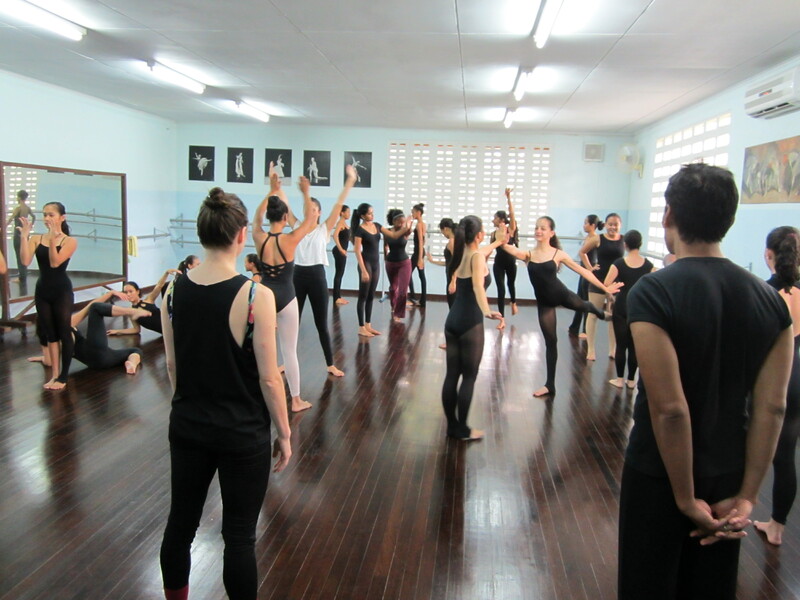 As part of Battery Dance Company’s 2012 South America Tour, we conducted one week Dancing to Connect programs in the northern cities of Belem and Fortaleza. As we quickly found out, the English language capacity in Brazil is very very low (lower than many of the African and Asian countries we toured). When touring to Brazil, do not underestimate the need for translators. Also, try to have translators paired with your local teachers/artists for the duration of the program so the learning curve does not need to restart each day. In Brazil, we were fortunate to have volunteer translators from CCBEU (Belem) and IBEU (Fortaleza), but did not have the hind-sight in Belem to keep translators with the same dancer for the whole week. In Brazil, not all bank branches exchange currency. To prevent running from branch to branch, go to a currency exchange company where you will receive a favorable rate. But be sure to visit before 5 pm when they close. Brazil is known for muggings. The greatest threat is against solitary individuals who are wearing jewelry and walking alone at night. Prior to arrival in-country the BDC team was notified of this risk. However, when walking near your hotel, this risk is rarely considered. Unfortunately, a member of our team was mugged and cut badly only one block from our hotel at the Hitlon-Belem near sunset time. The injuries turned out to be only minor and the thieves only acquired a fake watch. However, the event could have spelled disaster for the remaining tour. Do not underestimate the risk to your security when travelling to high risk areas, even for what might seem to be a harmless short walk to the nearby convenience store. In Brazil, there are processes and controls to everything. Your production schedule and use of a theater will be laid out in a contact that clearly spells out what will occur each day and by who. Any variation to this no matter how small will require additional negotiation and contract amendments. 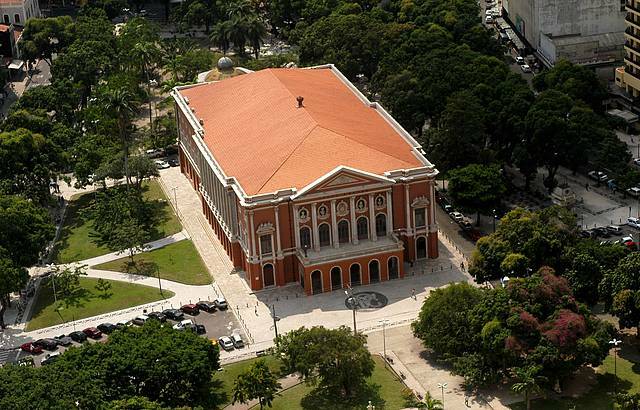 In Belem, not understanding this rigorousness, we failed to mandate that all lights in the historic Teatro da Paz be turned on during technical preparation days before the performance. On performance day, when all the lights were finally turned on an hour before performance, an electricity shortage caused the speakers to malfunction slightly creating an annoying buzzing sound. Thankfully, our Production Designer Barry Steele was able to work feverishly to dull the sound prior to performance start. 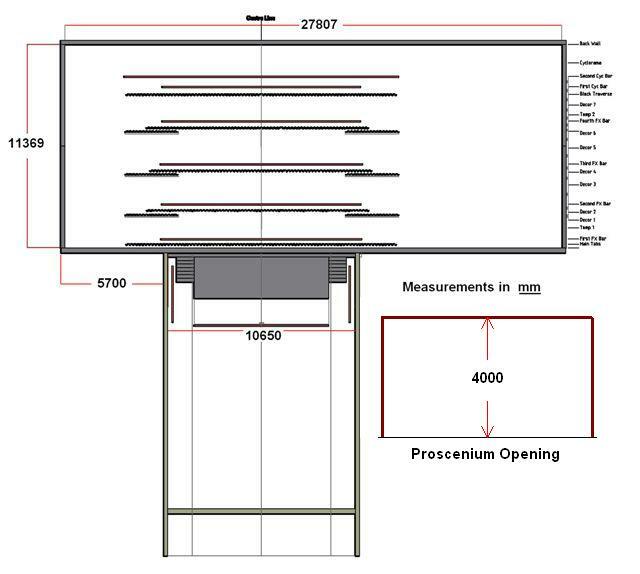 Nevertheless, be sure to have a full electrical run through prior to performance day and to include that requirement in any contracts drafted. 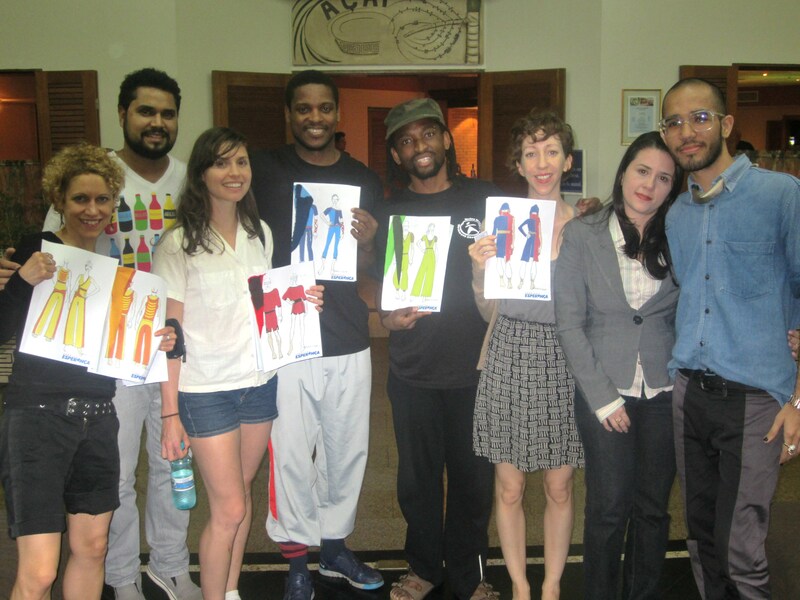 In an innovative plan, fashion designers from local partner Industry Esperenca designed custom costumes for the Dancing to Connect participants that were then sewn by local inmates in Belem’s prisons as part of their rehabilitation and reintegration program. The costumes were ready on performance day morning but one set needed slight modifications. Luckily, the designers were on hand to make the necessary changes. The students loved their costumes and had another memento of their experiences while the Dancing to Connect program reached new audiences and affected new people. Be open to new ideas that do not necessarily fit with your standard project plan – you may find new models for greater impact. 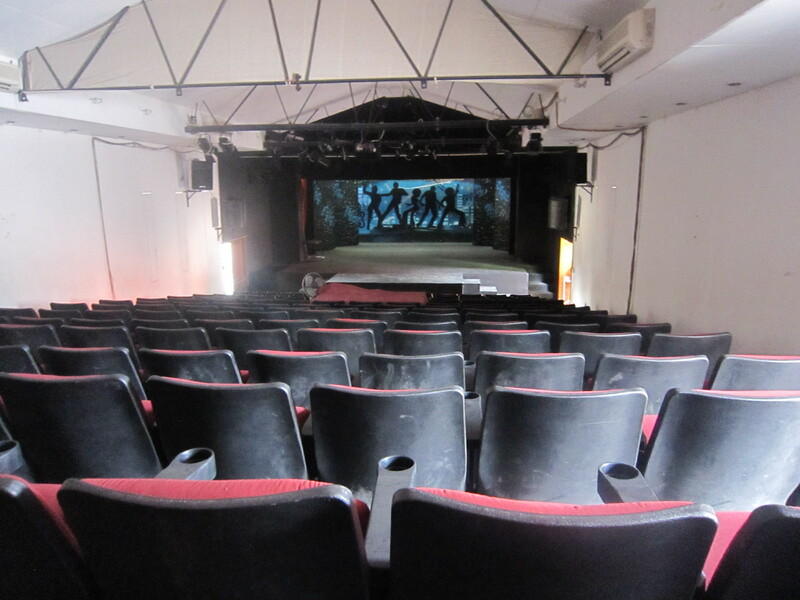 At Teatro da Paz, we were able to use the different spaces within the theater for group rehearsals throughout the day. 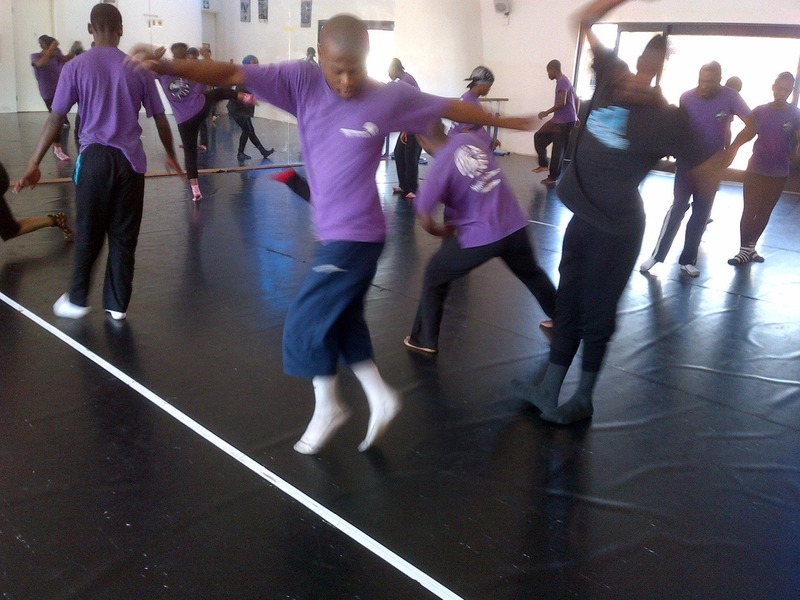 In one group, one of the participants dislocated his toe and the choreography for his group had to be reworked. Luckily, we had both enough space and time for this to occur. After a visit to the local hospital the participant was able to return in time, but be sure to have enough spaces and time on performance day for rehearsals up until performance. Also be sure to have your local partners present at the theater throughout performance day in case emergencies occur. 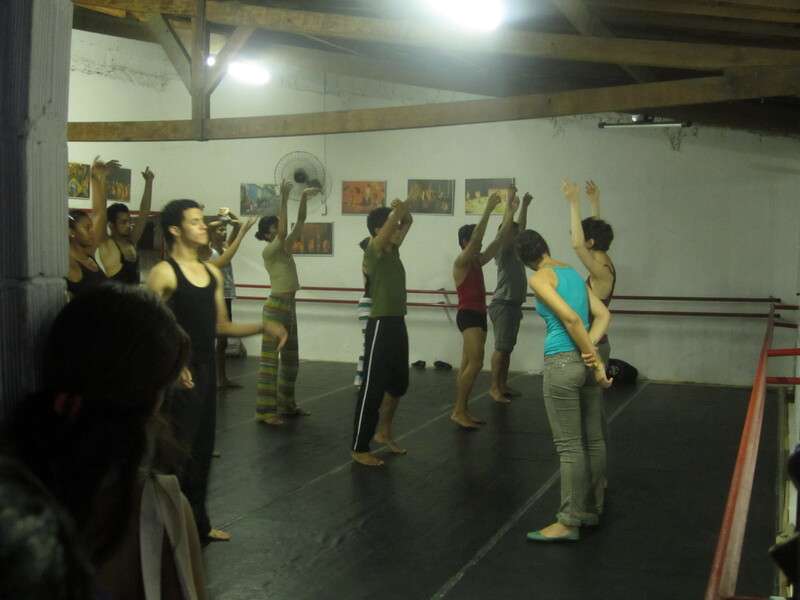 At IAP and a fifth workshop space located in the very large rehearsal room at the top of the Teatro da Paz, workshops were led by Robin Cantrell and Bafana Solomon, respectively. Carmen Nicole and Mira Cook led the university student workshops at UFPA and UEPA. 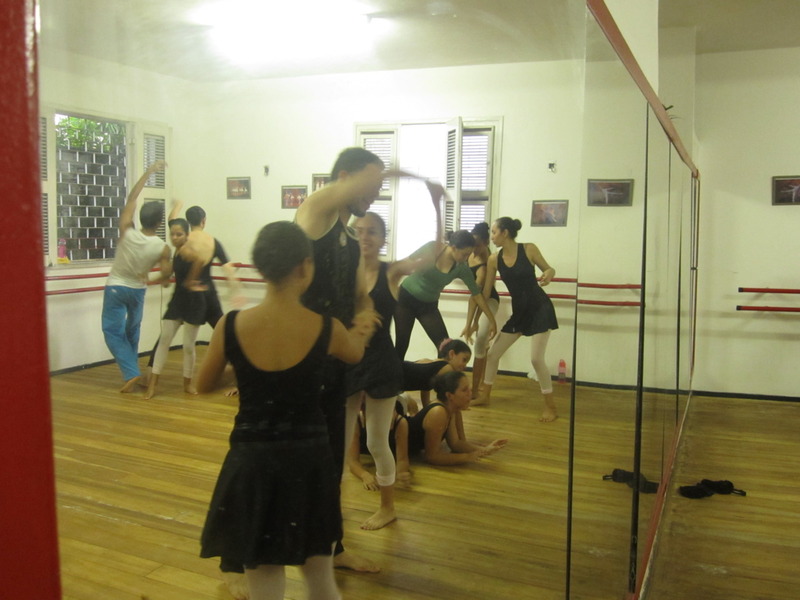 Sean Scantlebury led a ProPaz student workshop at their campus on the outskirts of Belém. Many of the ProPaz students came from disadvantaged backgrounds and some had been victims of abuse. In Brazil, where class divisions are extreme, the DtC workshops broke down barriers and introduced students to areas of their own city where they had never been before. Some of the participants in Bafana’s group expressed their worries over interacting with the wealthier students, an interaction they had not experienced before. They also informed Bafana that this was their first time being in that part of the city or seeing the historic theater other than in photographs or television. Many of the students dreamed of one day performing in the theater, but never thought that their dreams would be realized. Production Designer Barry Steele was attacked by two thieves one block from the theater, which was situated across the street from BDC’s accommodations at the Hilton Hotel. In the process of fighting off his attackers so they would not take essential technical equipment stashed in his backpack, Barry suffered a deep gash wound above the eye and was rushed to the hospital. ACAO Justen Thomas, FSN Angelina Smid, and a representative from local partner IAP were on hand at the hospital to oversee Barry’s medical care, and to guide him through the hospital and police processes. Angelina also enlisted the help of the former Minister of Justice for the State, who expedited the police process and offered armed security for the duration of the program. As a result of the excellent care provided to him from the hospital and the Embassy staff, and his own resilience, Barry was ready to go back to work in the theater the next day. 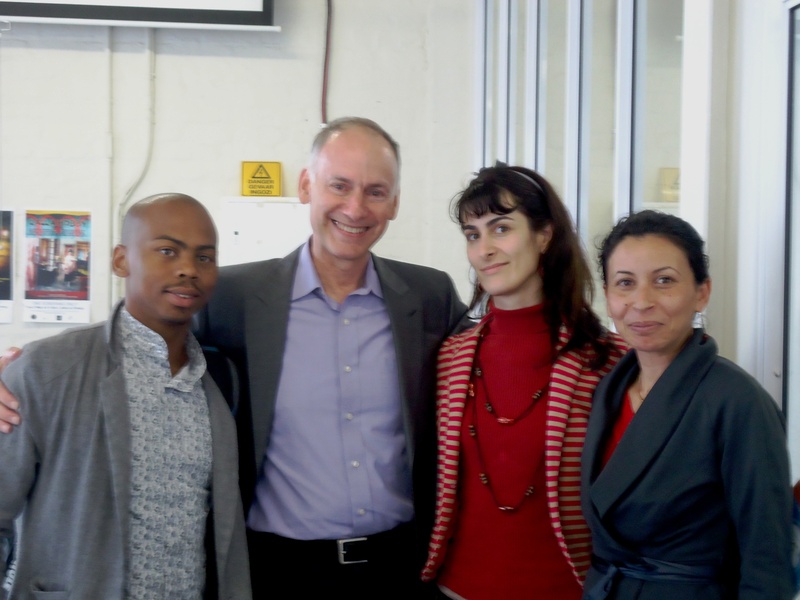 While Barry and the Embassy staff were busy in the hospital, the BDC team met with the Industry Esperanca fashion designers who presented their conceptual drawing for the costumes. A Hilton desk receptionist kindly provided translation for the meeting. The dancers were thrilled with the costume concepts and the designers offered to have suits made for them as souvenirs. In an effort to increase awareness for the final performance, the dancers performed an excerpt of ‘Perceptual Motion’ at CCBEU. 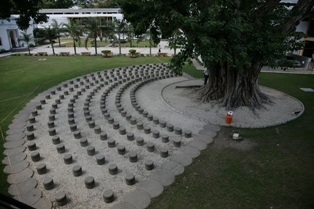 CCBEU, an English language institute funded by the Department of State, is the last remaining American institutional presence in Belém. The much needed translators required for the DtC workshops and for Barry’s work in the theater were also being provided in-kind by CCBEU. As a result of a city-wide transit workers strike, much of the expected public audience was unable to attend the show. In their place, the employees and students of the institute filled the audience and eagerly asked questions after watching the performance. 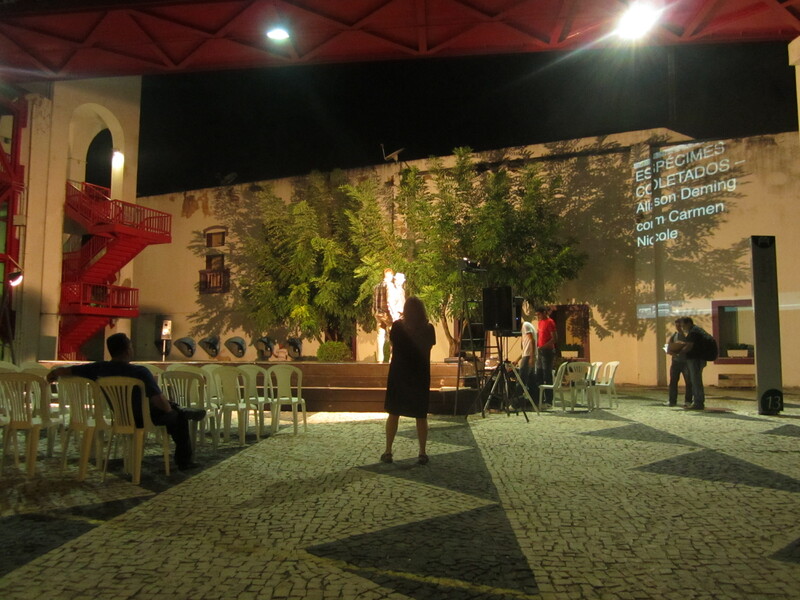 Media in attendance published a review of the performance while giving the public advance notice of the final performance to be staged at the Teatro da Paz. The U.S. Embassy Brasilia hosted a group lunch on performance day at the Hilton-Belém for all participants, local partners, and the BDC team. During the reception, Ana Unger’s professional dancers conducted a short performance, and shortly after everyone in attendance spontaneously rushed to the front of the room to dance together. SIDE NOTE: On a quick visit to the local zoo and botanical garden, Carmen became the main attraction for a group of visiting high school students, adding new meaning to the term ‘people-to-people diplomacy’. As the team and ACAO Ramona Sandoval left the zoo two heavily armored security officers began to ask us questions. Minutes later we began to understand that these were our ‘assigned’ security officers. They provided us the address for our next destination and then said goodbye. 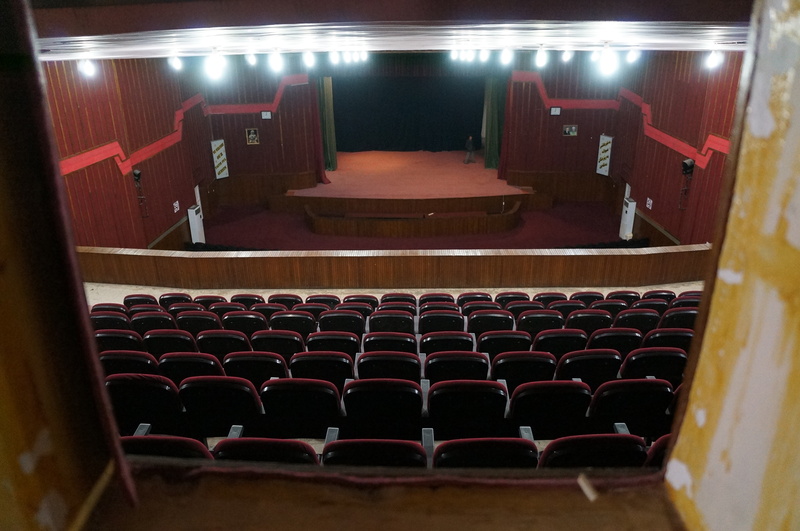 Tickets for the final performance at Teatro da Paz, which has a capacity of nearly 800 persons, were given out within 2 hours. 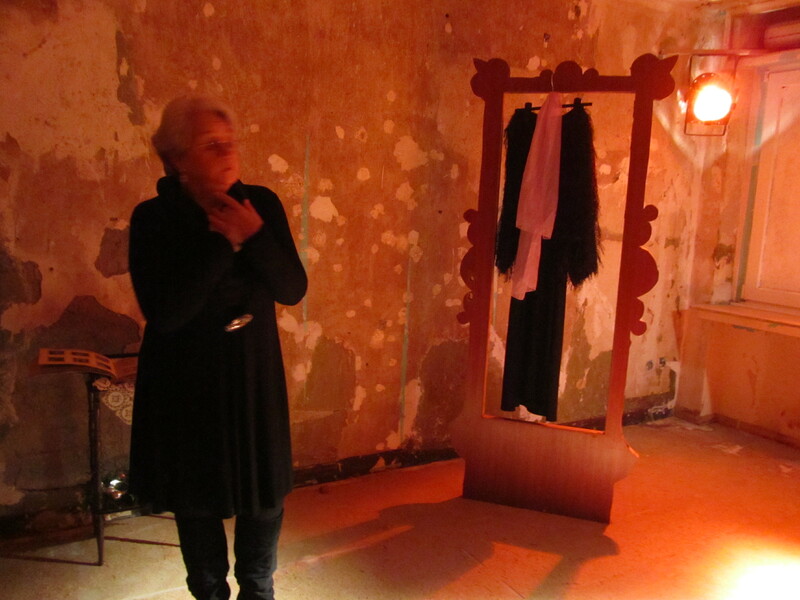 Male and female dressing rooms were provided for each group and the dancers were each assigned their own dressing room where they changed into their custom-made costumes. A few alterations were necessary for Carmen’s group and the Industry Esperanca designers worked quickly to make the adjustments. 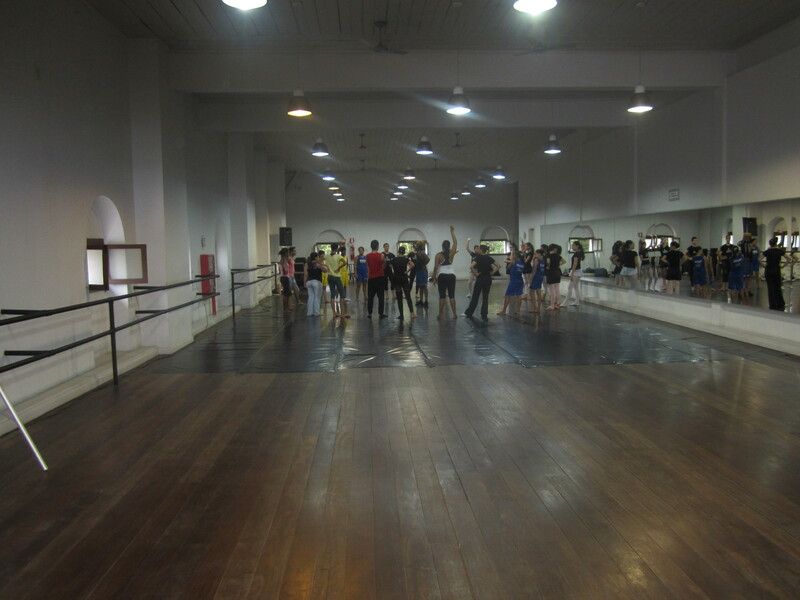 The dancers made full use of the theater, using two workshop spaces to continue rehearsals throughout the day. During Carmen’s group rehearsal, two hours before performance start and before her group’s on-stage rehearsal, one of her participants dislocated his big toe. More distressed about the prospect of missing the performance than his toe, he begged someone to ‘pop’ it back in. The participant was instead driven to the local hospital as Carmen’s group hurried to the stage to prepare the necessary changes to their choreography. A half hour prior to performance start, a problem with the speakers manifested, creating a loud buzzing sound, probably as a result of reduced electrical power when all the theater lights were turned on. Production designer Barry Steele worked quickly to reduce the annoying sound, and the performance was able to begin on time. Remarkably, the participant who was rushed to the local hospital made it back in time to perform with his DtC group. The audience thoroughly enjoyed the performance, at one point clapping in rhythm to the singing of Bafana’s group. After the performance, a reception was hosted on the grand balcony of the theater, where the BDC team and Embassy officers interacted with local partners and government officials. 2012 Sri Warisan Som Said Performing Arts (Traditional Malay Dance & Music Ensemble) performed at BDC's 31st Downtown Dance Festival. This meeting was a follow up to an exchange with Sri Warisan and Battery Dance Company that had happened in 2012, in Singapore. 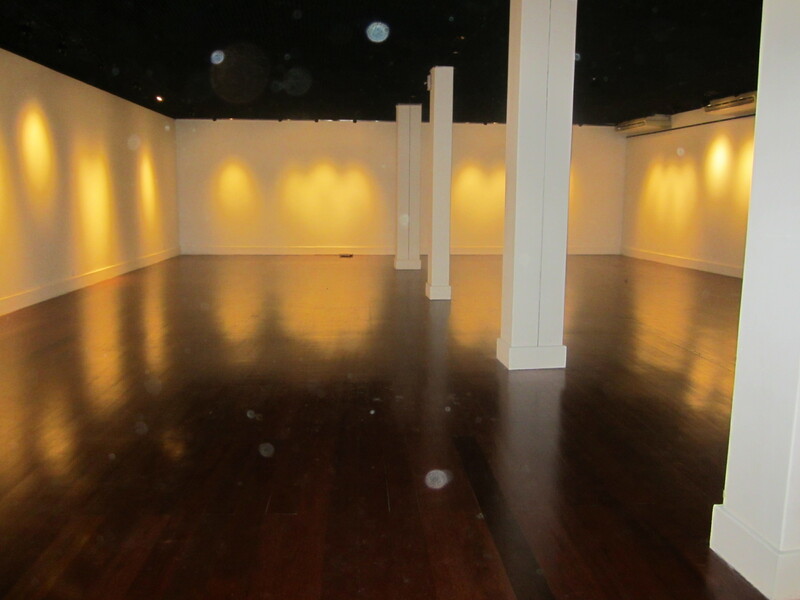 Battery Dance Company worked and performed here in 2012. Overview Iraqi Kurdistan is very different from the rest of Iraq. While the rest of Iraq remains relatively dangerous to travel through, Iraqi Kurdistan enjoys a bourgeoning economy and peace and security. There are also very important differences in rules and how things get done. 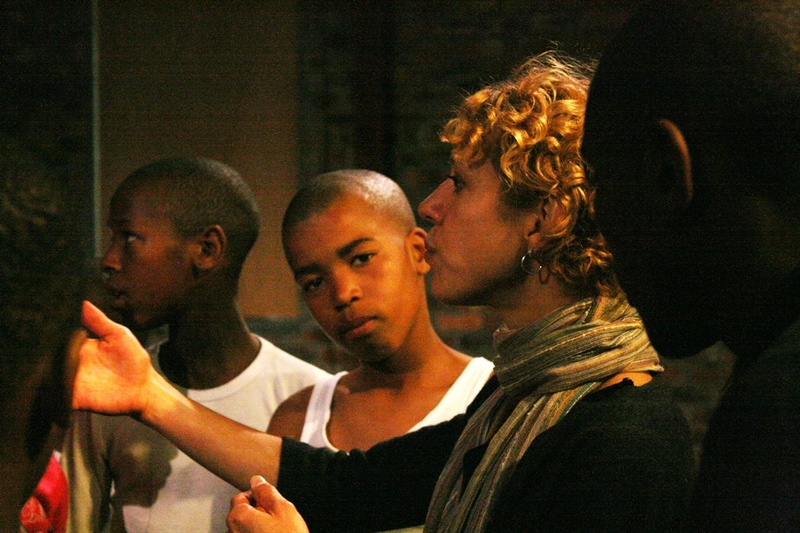 This Dancing to Connect program was led on the ground by, Robin Cantrell, a veteran Battery Dance Company dancer and teaching artist, and Roman Baca, an Iraq war veteran who is also a dancer and through a fellowship from The Mission Continues was trained to be a teaching artist at Battery Dance Company’s Dancing to Connect Institute. Important Visa and Travel Information According to the Iraqi Embassy and the U.S. Department of State, to gain entrance to Iraq you must complete a multi-step visa process which includes having the Iraqi Embassy send your visa application to a Ministry in Baghdad. We never heard back whether the applications were accepted by the Ministry. What is not advertised however is the loophole when entering Iraqi Kurdistan. Although it is official policy to receive visas (which all official representatives will tell you), the airport authorities at Erbil airport will only require you to purchase a $20 visa at the airport. However, without the pre-stamped visa you will need an official local letter of invitation in order to board the Erbil bound plane at your airport of transfer. This may change however, so be sure when travelling to Iraq to talk to someone who has just recently travelled there to find out what the on the ground visa policy is. If you’re planning on travelling to Baghdad, try to apply for visas at least 6 months before your departure and be prepared for the trip to be cancelled by relevant authorities up to 1 week prior to departure. Travel Insurance Travelling to Iraq, or any other conflict zone or area, requires a special type of travel insurance. In the fine print of most available travel insurances will be indicated that the insurance does not cover injury resulting from conflict, war, etc. in a previously known conflict area. Instead, search online for travel insurances for Iraq or ones that specifically cover conflict zones. Purchasing these insurance options will also allow you to cover kidnapping if you choose. Bring Lots of USD US currency is widely accepted in Iraqi Kurdistan, although there is a lack of safe ATM’s for cash withdraw and credit cards are not accepted everywhere. Instead plan on bringing in American cash the amount you will need on the ground. This may also include program expenses that have not been paid. Be sure not to violate US travel rules on currency amounts for travel. Also, you should plan ample time for the settling of bills which usually occurs over a cup of tea. Security vs. Reach Although as a whole Iraqi Kurdistan is safer than the rest of Iraq, there are variations between the cities in the region. 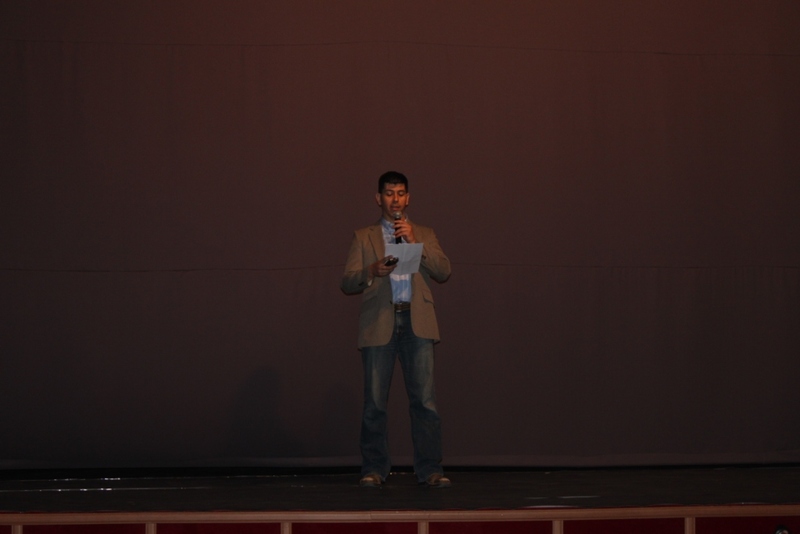 Originally we had planned on doing the program in Kirkuk with a group of students there. 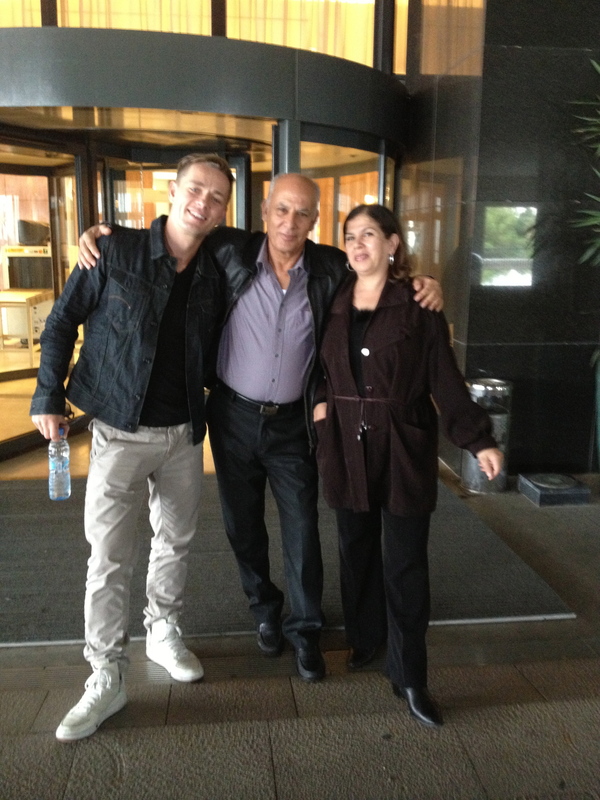 However due to security concerns the program was moved to the safer Erbil. Rather than sacrificing the students we had originally wanted to reach, we transported the students to Erbil and through the U.S. Embassy and Consulate provided accommodations for the students. Security is paramount, but you do not have to sacrifice reach if you have the right local partners. For the program, Roman an Iraq war Marine veteran who was previously a dancer and a choreographer participated as a teaching artist and fieldwork project manager. Veterans not only have skills that can be applied to your program, but also possess incomparable experience of how to work in conflict zones, how to recognize and deal with potential risky situations, and may have greater insight into local culture and experiences. Keep Abreast of Current Events One week before our departure to Iraq, an American English language teacher was killed by his Iraqi student in a nearby city in the Kurdish region. 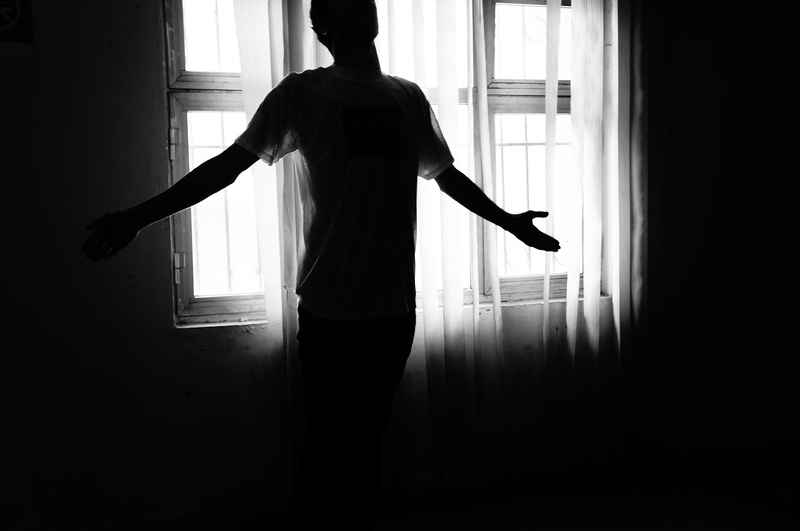 Also one week before departure, news organizations reported that Iraqi ‘Emo’ youth in the city of Kirkuk were being murdered for perceived homosexuality. Learning about these events and understanding how they relate to your program are essential to understanding whether project plans need to be changed or not. They are also essential for understanding the risks of the next lesson learned: to photograph or not to photograph. Marketing versus Security Despite the perceived security in Erbil, local partners informed us of the potential security risks of those who are found to be working with Americans. Every organization has a need for photography and video for marketing and fundraising purposes. However those needs come secondary to the health and well-being of your stakeholders. Before you take any photographs or videos, understand the risks by talking to local sponsors and partners and staying on-top of the news. Make sure to get photography and video waivers from participants and the families of minors, to add a secondary level of risk evaluation. Always err on the side of caution. This applies to photographing, videotaping, and identifying your local partners as well. 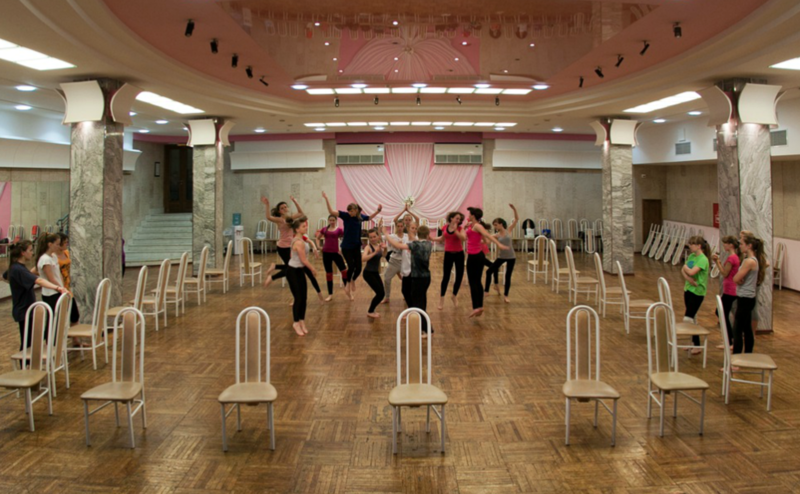 Working collaboratively with American and local partners, Battery Dance Company used the art of dance as a medium for healing and youth empowerment in Iraq. 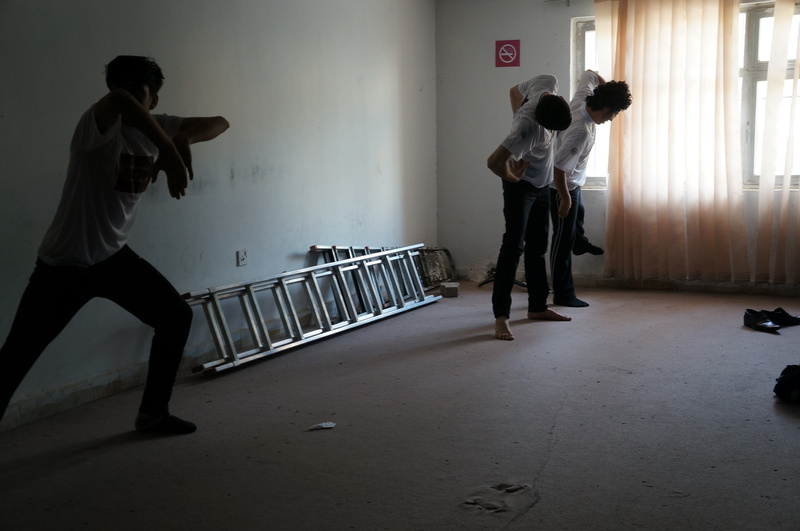 Employing Battery Dance Company’s signature arts education methodology, Dancing to Connect (DtC), a pair of American teaching artists engaged with 28 Iraqi students, ages 17 – 22, and two local teacher trainees over a period of one week. They worked in a group that crossed gender, religious, social and geographic boundaries. Together and under the guidance of BDC’s teaching artists, the students created choreography that spoke to the issues of inclusion/exclusion, the struggles of living in a war-torn country, and their hopes for a better future. As the process went forward, the initial differences between the students melted away. Roman Baca, a choreographer and a Marine veteran who had served in Fallujah, approached Battery Dance Company to host him as a Fellow of The Mission Continues. TMC is a non-profit organization founded by Eric Greitens, a former Navy Seal, that provides support for Iraq and Afghanistan War Veterans, funding their service in community organizations in the U.S. to regain their strength and purpose. 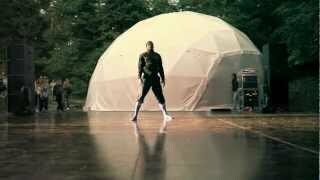 Beginning in January, 2012, Baca was trained by Battery Dance Company in leading Dancing to Connect workshops for youth and young adults and eventually worked side-by-side with BDC teaching artists in New York City public schools. 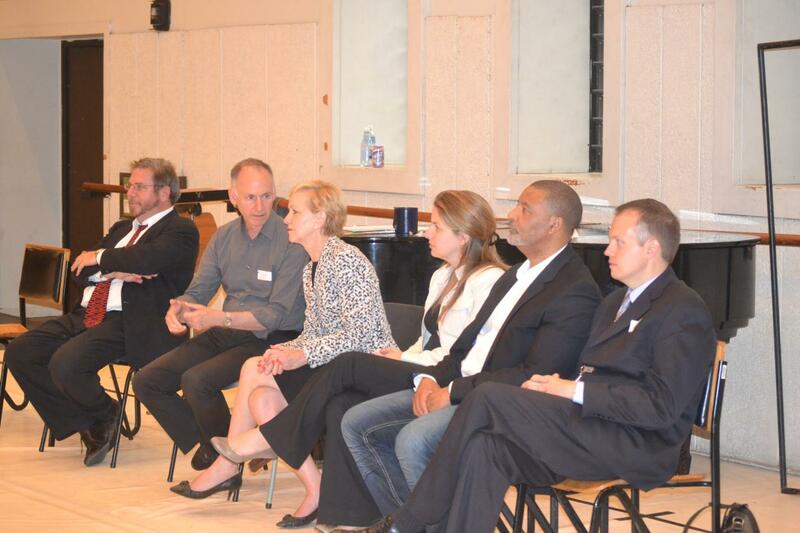 Given his earlier experience in Iraq and his concern for the Iraqi people, Jonathan Hollander, Artistic Director of Battery Dance Company, posed the question, “Would you like to return to Iraq?” Baca’s affirmative answer prompted Hollander to approach the NEA/PPD Office in Washington and the U.S. Embassy in Baghdad to propose a Dancing to Connect program. Knowing that Baca would need the support of at least one of BDC’s experienced teaching artists, Hollander asked the Battery Dance Company members for volunteers to go to Iraq. Each and every member expressed an interest in going. Robin Cantrell was selected – in part because of the fact that Hollander wanted to have a man and a woman lead the program, anticipating that there would be mixed genders among the workshops participants. The Embassy in Baghdad forwarded BDC’s proposal to the Consulate in Kirkuk, where Susan Harville, the Public Affairs Officer, responded enthusiastically. Sue and Jonathan began putting the plans in place. Sue was already working with a group of young people in her English language program and felt that the DtC workshops would be a great experience, a reward of sorts, for them. However, because security conditions in Kirkuk wouldn’t lend themselves to an easy flow for students coming into the Consular Compound, or for the American teaching artists to go out into the City each day, she proposed to move the venue to Erbil. This required the active cooperation of her counterpart at the Consulate in Erbil, Matthew Ference. He agreed on the condition that students from Erbil could also participate. In the end, a group of 19 students from Kirkuk drove up to Erbil with a teacher from the Institute of Fine Arts and Helen Patou from the Consulate. 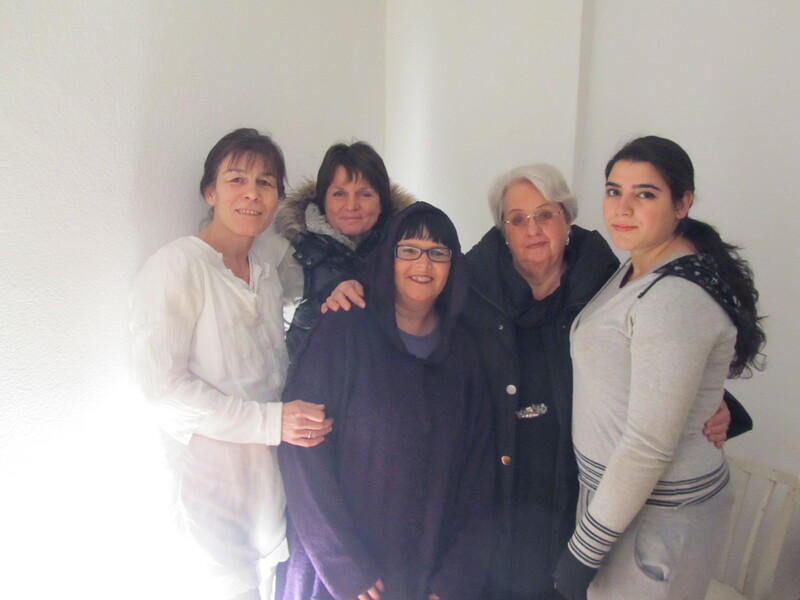 They stayed in a hotel for the duration of the program. 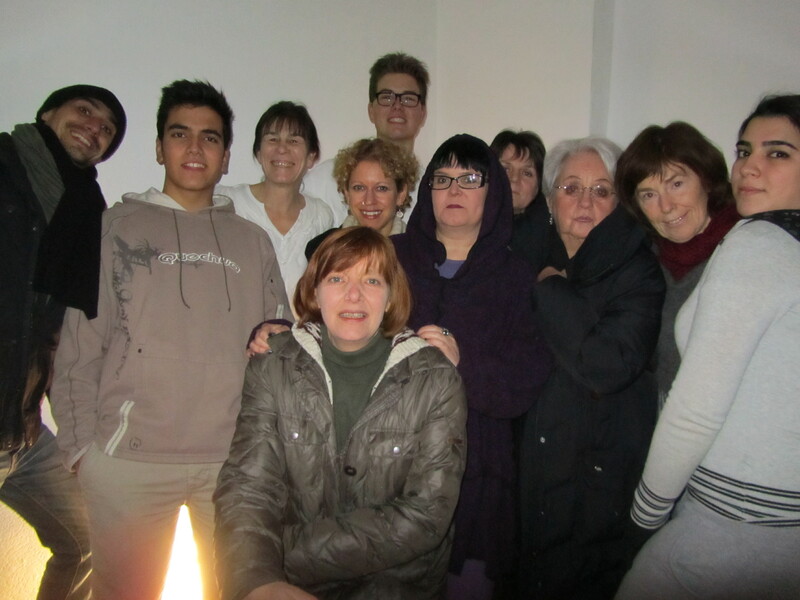 Ten students from Erbil and one teacher formed the complement of the group. Over the course of the week, the students worked with Baca and Cantrell, learning the craft of choreography as a vehicle for expressing their emotions and creative visions. None of the participants had taken formal dance classes in the past. 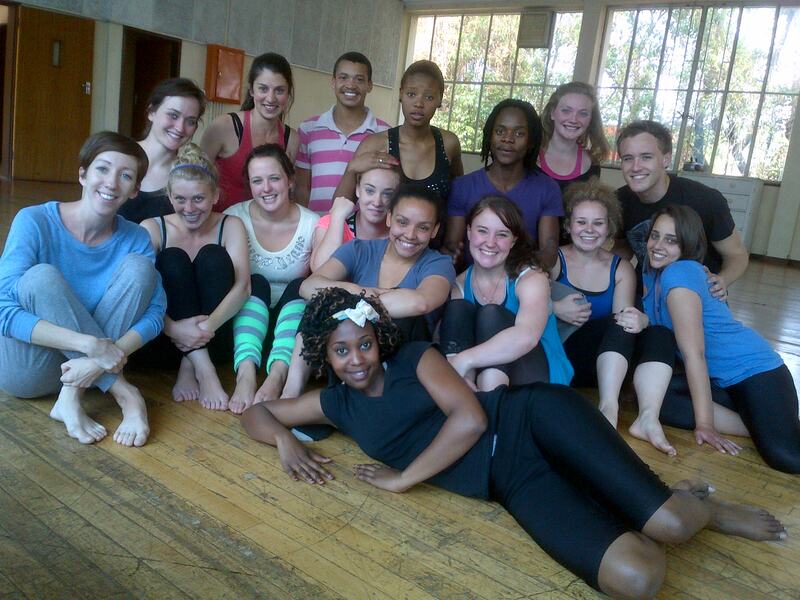 Many were students at the Institutes of Performing Arts where they were studying acting or directing. As such, everyone began the process on a similar, very fundamental level. They knew very little about the medium of dance and even less about the art of choreography. 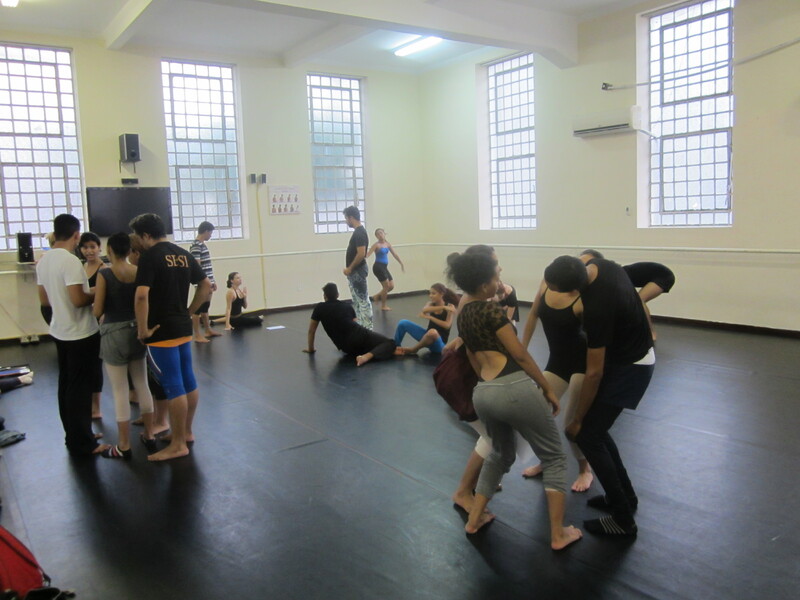 Baca and Cantrell coaxed the students into devising movement by giving them a variety of tasks that built from individual creative movement phrases into group choreography. The differences between the students from the two cities were noticeable at the beginning of the workshop. They ate lunch on different sides of the courtyard and expressed passionate opinions and observations about one another in discussions. 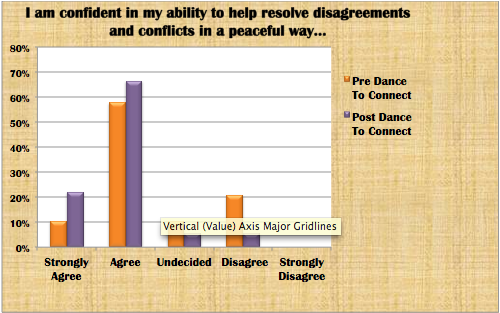 As the workshop developed, and the teaching artists initiated the mixing of demographics, the differences disappeared. On the last day of the workshop the students from both cities and religions were intermingled, professing friendship, and singing traditional songs together. NPR story about Iraq war veterans and dance. Participants at a temporary workshop location. 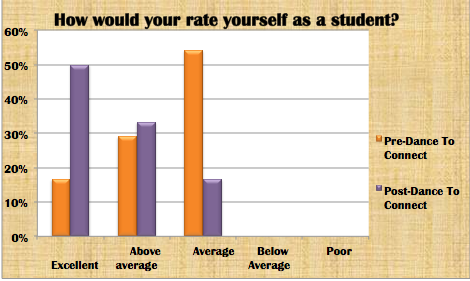 Survey: How would you rate yourself as a student before and after Battery Dance? 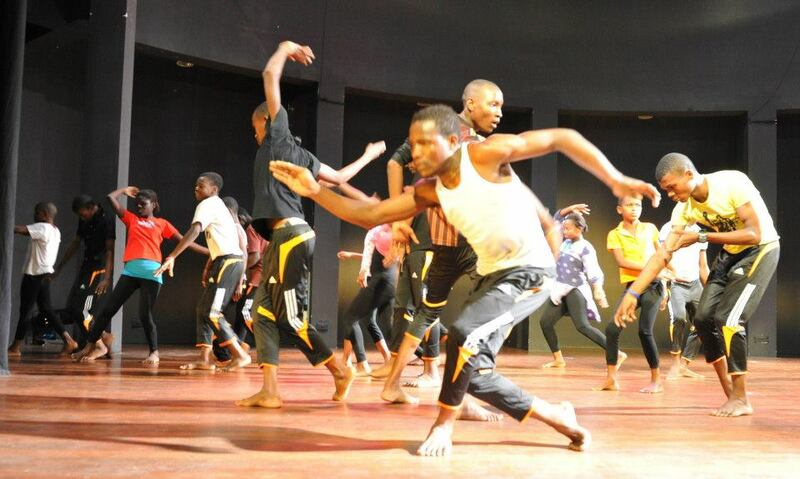 In 2012, Dancing to Connect performed and taught in Dar es Salaam, Tanzania. Tragedy struck the day prior to the Dancing to Connect performance with the terrorist attack on the U.S. Mission to Benghazi, which claimed the lives of Ambassador Scott Stevens and two other embassy officers. After Embassy Dar es Salaam assessed the local security situation and briefed the Company, BDC and the Embassy decided against cancelling the following day’s performance, although Ambassador Lenhardt’s attendance was perceived as too high a risk. Learning about these events and understanding how they relate to your program are essential to understanding whether project plans need to be changed or not. Among the difficulties faced in Tanzania was determining an adequate backdrop for the performance. 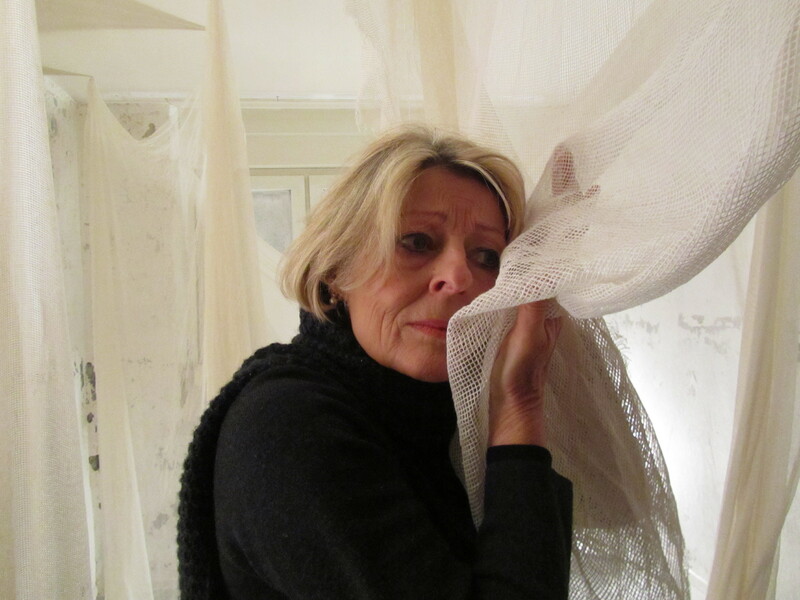 In lieu of a scrim of cyclorama, Cultural Affairs Assistant Suleiman came up with the creative idea of utilizing unused Embassy bed–linens which were clipped together by Barry to form the backdrop for video projections and lighting. It is important to not loose a creative opportunity. 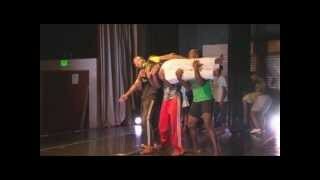 Battery Dance Company (BDC) embarked on its second visit to Tanzania on September 6th 2012, with programs organized in conjunction with the U.S. Embassy in Dar es Salaam. Funding for the program was provided by the U.S. Department of State’s Bureau of Educational and Cultural Affairs and the U.S. Embassy. The 10-day tour was characterized by a two-pronged approach with a high visibility marquee performance coupled with outreach programs targeting undeserved youth. The day after arriving in Dar es Salaam, the Company had a rest day which they used to visit local marketplace KariaKoo and to explore other areas of Dar Es Salaam. 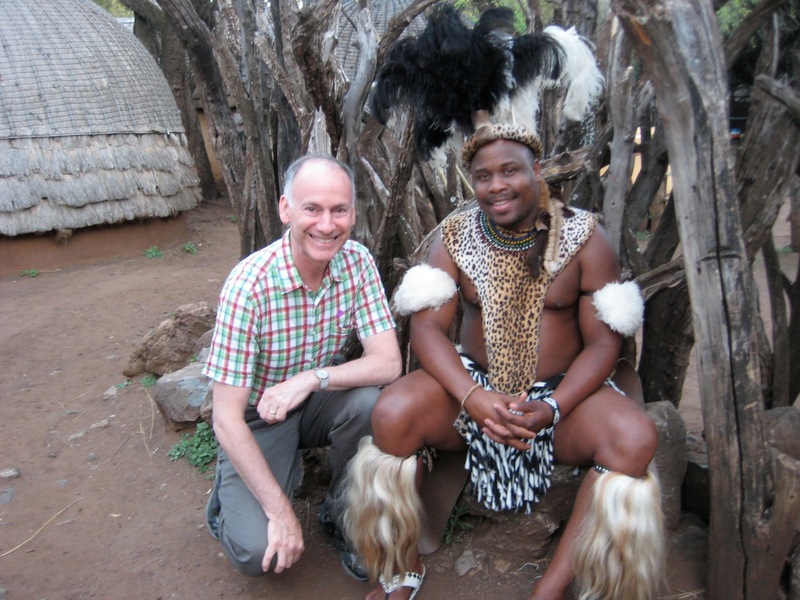 The Company found the Tanzanian people to be very open and welcoming and had the opportunity to interact with a group of Maasai, although communication was difficult. The following day began with a press conference followed by site visits at the workshop venues and theater. During a visit to NGO Baba Watoto Center, the students acrobatically welcomed BDC with a short performance, while at the Tanzania House of Talent, the Company was treated to a short musical number by two gifted singers. The workshops at Baba Watoto were in such high demand that a fifth workshop group was added to the four originally planned. Quite incredibly, Suleiman (Tanzanian Cultural Affairs Assistant) was able to secure a 5th workshop venue at the Russian Cultural Center (in Tanzania) in time for the first day of workshops. U.S. Ambassador Alfonso Lenhardt kindly made time for a courtesy call, prior to the beginning of the first workshop day, and briefed the Company on the Embassy‘s efforts to promote youth education and employment as well as his shared NY heritage. During the visit to Tanzania, Deputy Director of Battery Dance also led evaluation workshops with 8 THT employees and with two volunteers from Baba Watoto. Meanwhile, Production Director Barry Steele held two workshops with 30 participants from THT and Cloud FM, providing training in the principles of lighting and design. Bibbies on Choice FM, Tanzania’s most popular morning show, also aired a 6-minute interview with Salem about Battery Dance Companies work in the country. Unfortunately, protests targeting U.S. Embassies erupted on September 11 across the Muslim world, seemingly in reaction to an anti-Islamic film produced in the United States. Despite fears of the violence and anger spreading to Dar es Salaam, Battery Dance Company’s members continued to feel welcomed by the warm and friendly Tanzanian people. Not once did any member of the company experience any ill-will or negativity. After stage rehearsals and prior to the final performance at The National Museum and House of Culture, participants from Baba Watoto and the International School of Tanganyika danced, laughed and taught each other new choreographic moves on the lawn at the theater, exemplifying one of the main goals of the program: uniting youth from different backgrounds and communities. Suleiman also provided her own personal video camera, allowing the performance to be recorded. While T-shirts and track suits were provided to Baba Watoto and THT students, many of whom had worn the same clothing for each day of the workshops. Lunch was provided for all students on the day of performance. 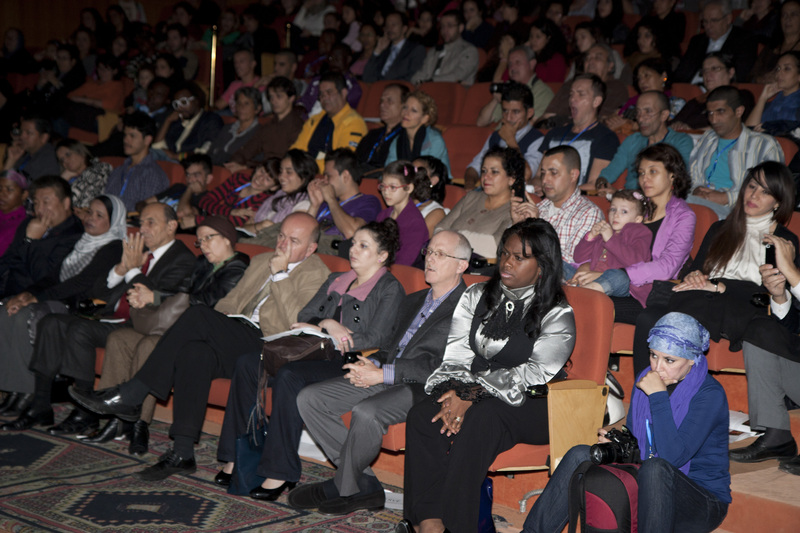 With opening remarks from U.S. Embassy PAO Dana Banks and the deputy director of BDC, the final show began to a full capacity audience of approximately 475 who responded with rapturous applause and gasps of amazement. 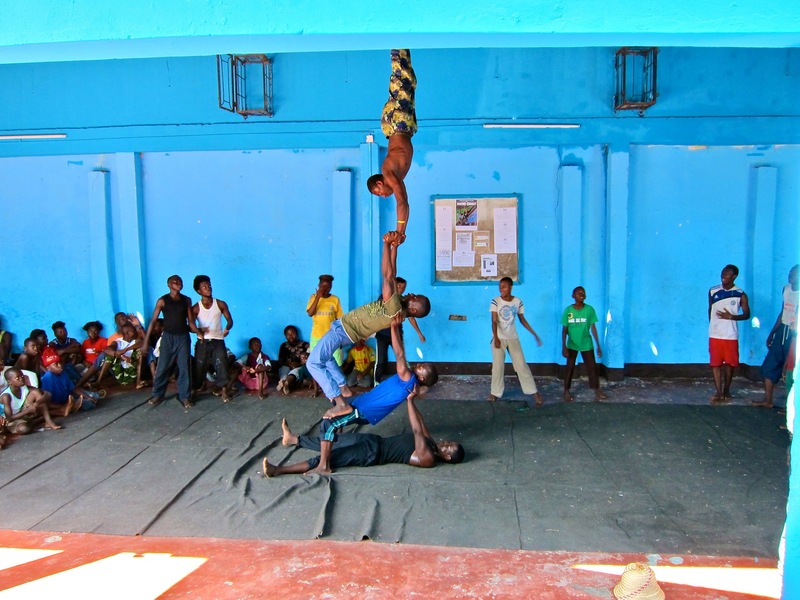 The awe of audience members at seeing the acrobatic movements that Baba Watoto participants integrated into their choreography was palpable. Many audience members were being exposed to the local domestic talent for the first time, making the socially mixed final performance all the more meaningful. It was also notable to see members of different social classes mingling, sharing and laughing together at the intermission. The final performance ended with a standing ovation from the entire theater --- the perfect finale to a very emotional program. 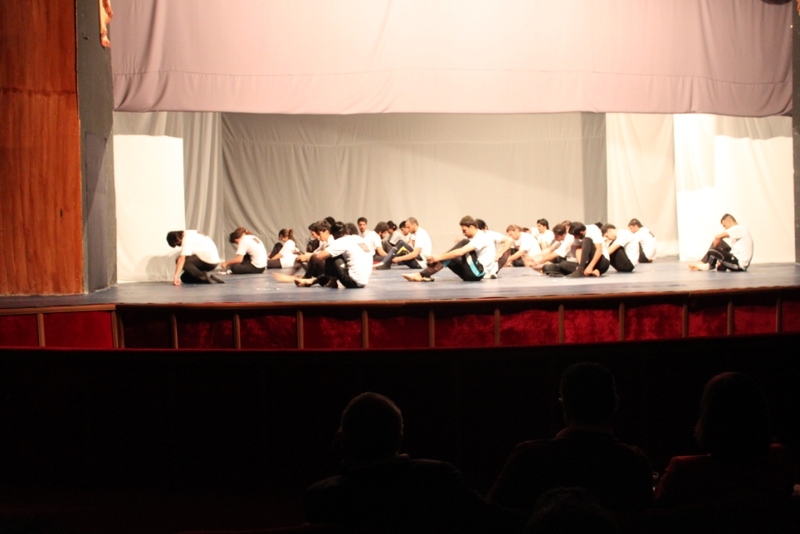 Overall, the performance and workshops met with outstanding response. 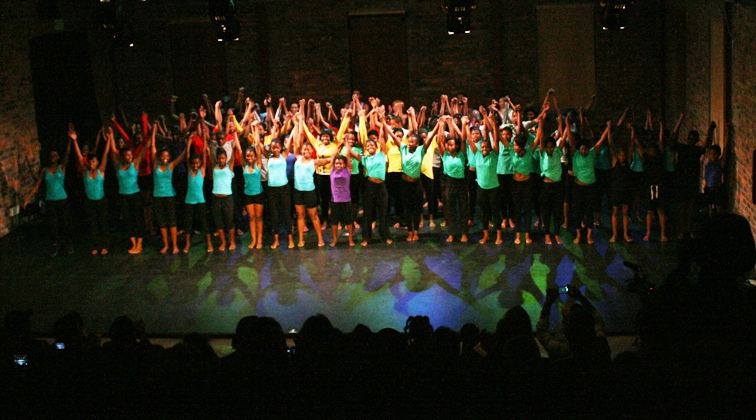 Choreography that the students created during the program was reprized when First Lady Michelle Obama visited Tanzania on July 1, 2013. 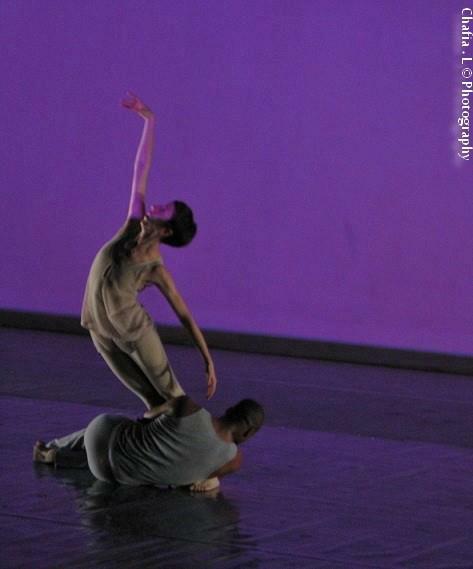 1 Performance of Perceptual Motion by Battery Dance Company in the 4th Annual International Contemporary Dance Festival. 3 x 2 Hour Masterclasses with L'ONCI and the Algerian Dance College, led by by BDC dancers Tadej Brdnik and Carmen Nicole Smith. 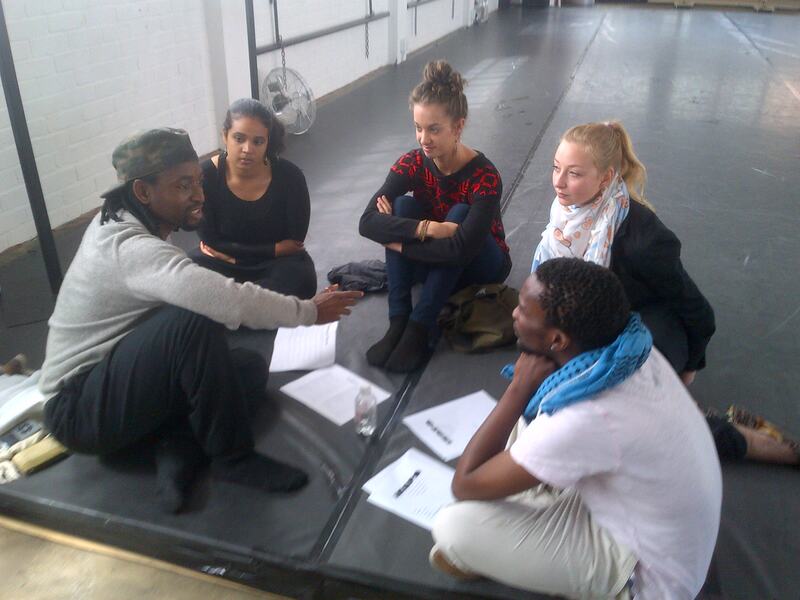 2 BDC dancers were Judges at the Algerian Contemporary Dance Festival. The company had to modify it’s costuming out of respect for Algerian culture by wearing full-length unitards under some of the garments. It was interesting to witness the audiences' reaction to other countries that performed at the festival. Some countries wore revealing clothing either in ignorance or disregard for the conservative norms. It did not reflect on the jury deliberations and seemed not to be an issue with respect to the general audience. However, that was only a superficial reading of the audience reaction. Additionally, the Ministry of Culture did not comment publicly about costuming or even the controversial subject matter of the performance. Algeria is a male dominant culture, and as the only woman on the judging panel at The Algerian Contemporary Dance Festival, BDC Dancer Carmen was treated disrespectfully by some of her fellow judges. This caused another member of the panel to complain to the Ministry of Culture about the situation. It is always exciting to develop sustainable connections from various programs. Equally as exciting is when these relationships evolve in new and interesting ways. Battery Dance and the Algeria program proved to be one such opportunity providing three years of continued partnerships taking different forms around the theme of cultural exchange and dance. Each venture has been sponsored by the U.S. State Department along with the Algerian Ministry of Culture, demonstrating the positive role that dance and the arts can have in maintaining diplomatic relations. 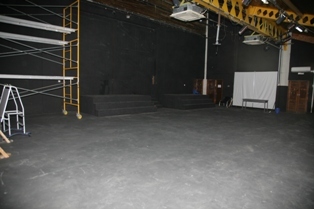 The initial tour of Battery Dance to Algiers occurred in February of 2010. Two veteran dancers and teaching artists, Robin Cantrell and Sean Scantlebury, spent one week working with the National Algerian Dance Company L’ONCI. The program included a Dancing to Connect residency with a performance of the resulting piece. 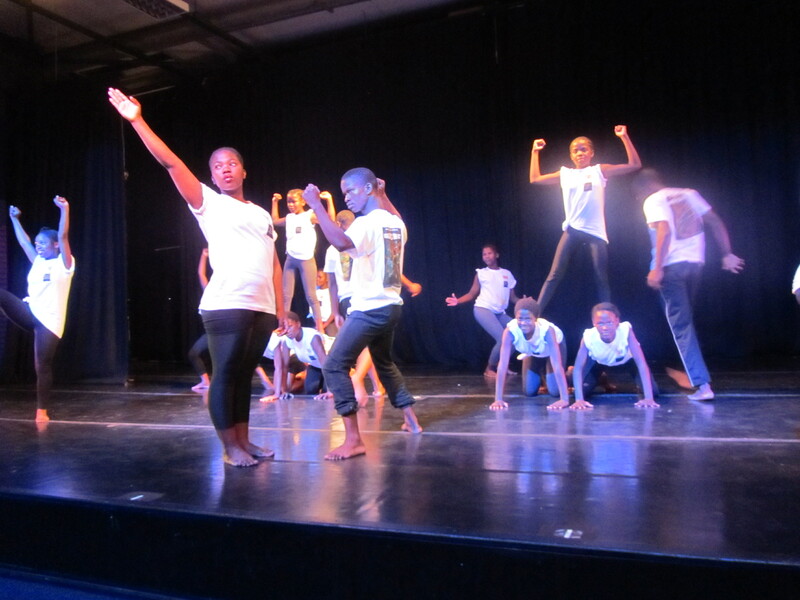 The performance featured L’ONCI dancers along with Battery Repertoire performed by Robin and Sean. The success of that initial venture led to an additional full company program in October of 2010. 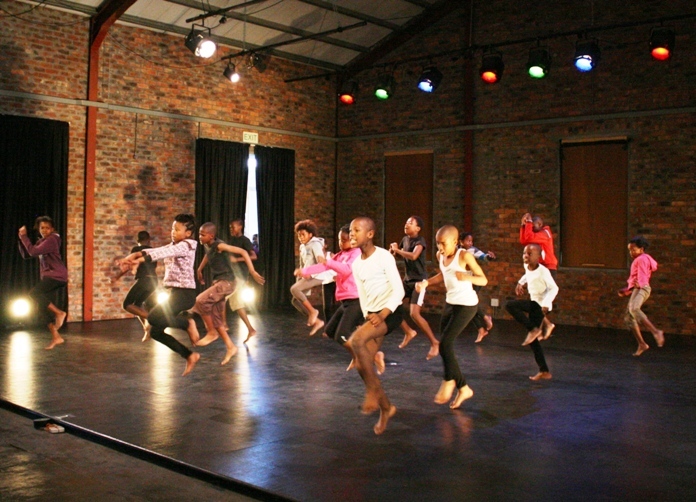 The second tour involved three different Dancing to Connect residencies with the full L’ONCI troupe and performances in three outlying cities. 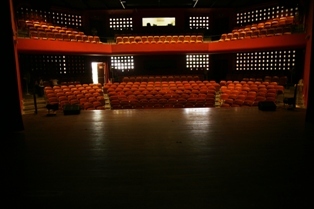 It culminated in a final event at La Salle de Mougar Theater. 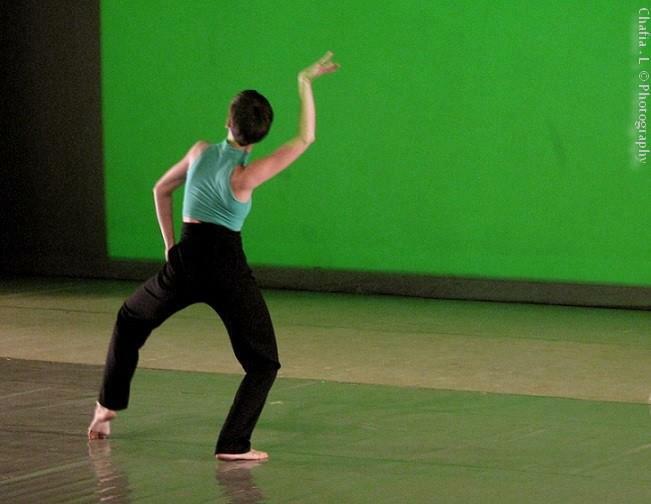 Shortly thereafter, two Algerian dancers visited Battery Dance and joined the company as supplementary dancers for the New York season in April of 2011. 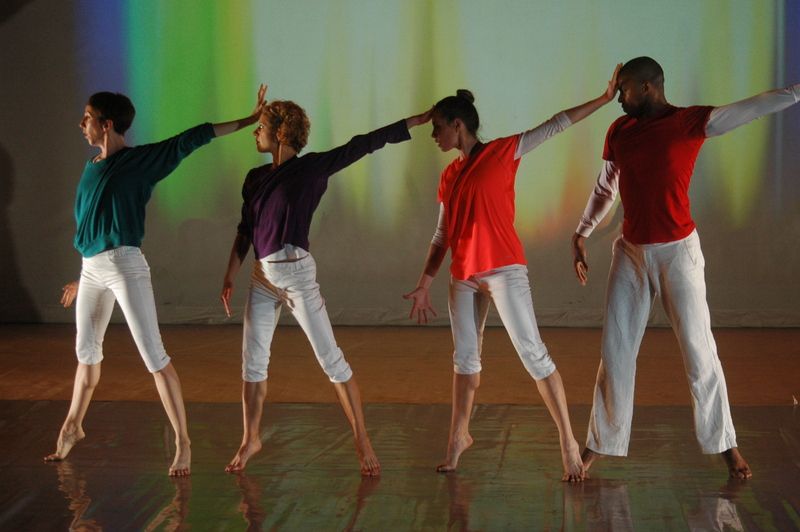 Most recently, the company was called back to Algiers to participate in the fourth annual Contemporary Dance Festival sponsored by their Ministry of Culture. The Algerian Contemporary Dance Festival is a fantastic initiative to build the contemporary dance scene in Muslim North Africa. Given the cultural constraints of a conservative Muslim population, progressive dance forms have fallen behind in exchange for more traditional forms of folk dance. In addition to providing a forum for modern dance performance, the festival provides monetary incentives by offering a competitive component. The majority of participating companies competed for cash prizes ranging from 5000 Euro to 1000 Euro. Some of the represented countries included Cuba, Venezuela, Spain, Argentina, Syria, Iraq, Tunisia, Democratic Republic of Congo, Egypt and many companies from Algeria. Battery Dance was a guest of the festival with a full company presentation and two company members functioning as judges of the competition. Tadej Brdnik and Carmen Nicole Smith arrived in time for the opening ceremonies of the festival. They were two of five members of the jury panel that also included a Bulgarian dance teacher and two Algerian independent choreographers and teachers. Performances were given each day of the week long festival. After viewing each evening’s choreographies, the judges would discuss the performances over dinner. By the end of the week, the jury was responsible for ranking the three top companies and also submitting a special award to a choreographer whose work showed particular promise. The deliberation process was far from smooth and Carmen Nicole encountered some challenges as the only woman on the panel. The treatment towards Carmen by one judge in particular was so disrespectful that another judge complained to the Ministry of Culture. Given the male dominant culture, this was not a surprise. That said, there were marked changes in gender roles in the direction of equality- an overall a positive sign. And despite the challenges Carmen faced deliberating with some members of the jury, there were many fun moments as well. Mr. Kador (one of the judges) even provided her with a comedic serenade over one of the meals. 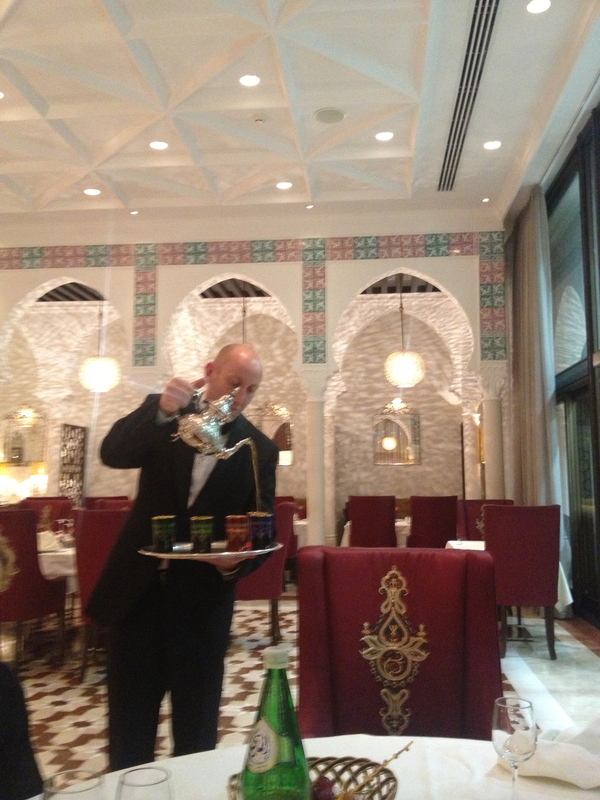 Another time, the group enjoyed traditional Algerian fare with explanations provided by the Algerian judges. In the end, a decision was made with the first place prize given to Cuba, second place to Argentina, third to Tunisia and the special prize awarded to a young Algerian choreographer. The closing of the festival involved a lovely presentation of awards, a feast for all participants and traditional Algerian dance and music. In addition to their participation on the jury, Tadej and Carmen taught master classes to L’ONCI and at the major dance college in Algiers. Tadej focused on Graham based technique classes while Carmen taught a variety of contemporary techniques along with some Battery Dance Company repertoire. The classes occurred over four days and lasted two hours each day. L’ONCI also took the opportunity to discuss choreographic techniques. The two were invited to attend an open rehearsal of L’ONCI prior to the first day of the festival for advice on one of their new performance pieces. This placed Carmen and Tadej in a difficult position as judges of the competition, yet they managed to remain neutral and offer some comments about choreography in general as opposed to critiquing the L’ONCI competition piece directly. Needless to say, it was a delicate position to navigate especially when L’ONCI did not win any of the top rankings in the competition. The master classes also involved very important discussions about dance training in the U.S. and progressive definitions of dance. 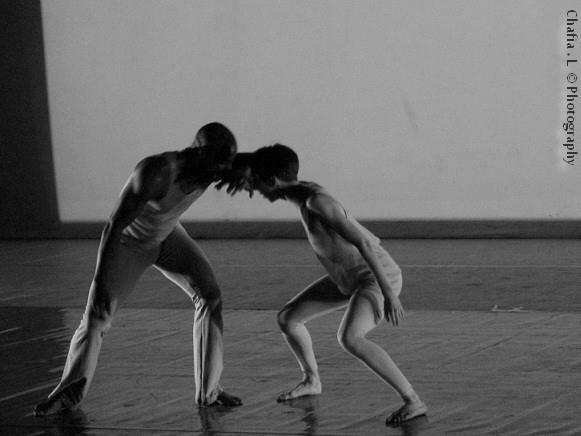 Algiers remains quite conservative in its approach to contemporary dance training and performance. 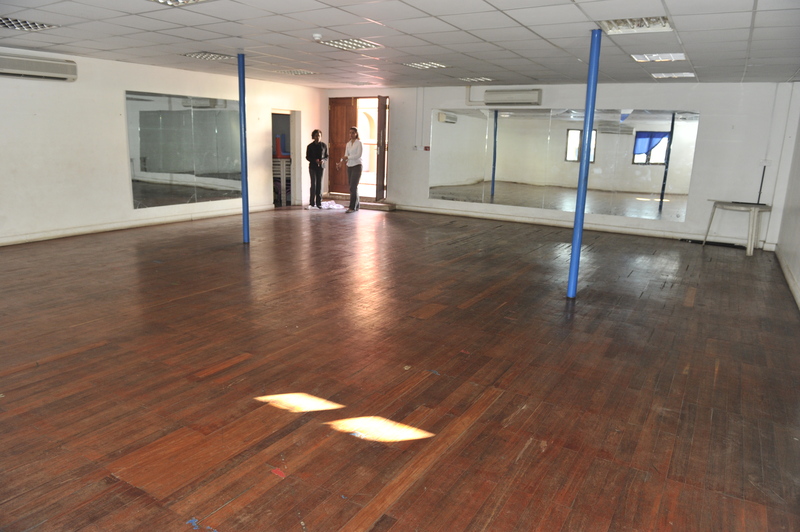 It is highly probably that the contemporary dance scene will continue to shift with the ever-increasing spirit of openness in Algiers. 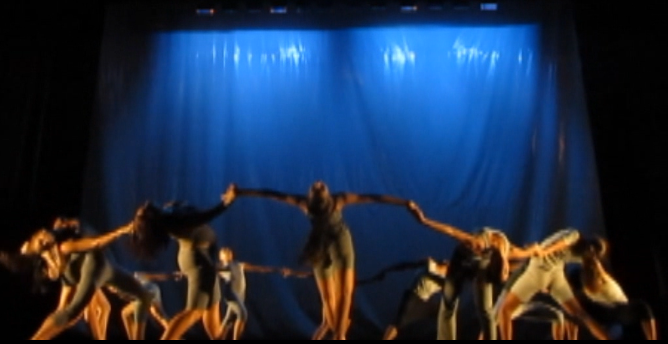 As previously mentioned, Battery Dance Company had multiple roles throughout the festival. Tadej and Carmen functioned as judges of the competition, master class teachers and also as guest performers. The other three members of Battery Dance Company along with Barry Steele, the company’s technical director, joined Carmen and Tadej to represent the U.S. The four spent only three days in Algiers arriving in the morning of day one and performed the following day and returned home to the U.S. 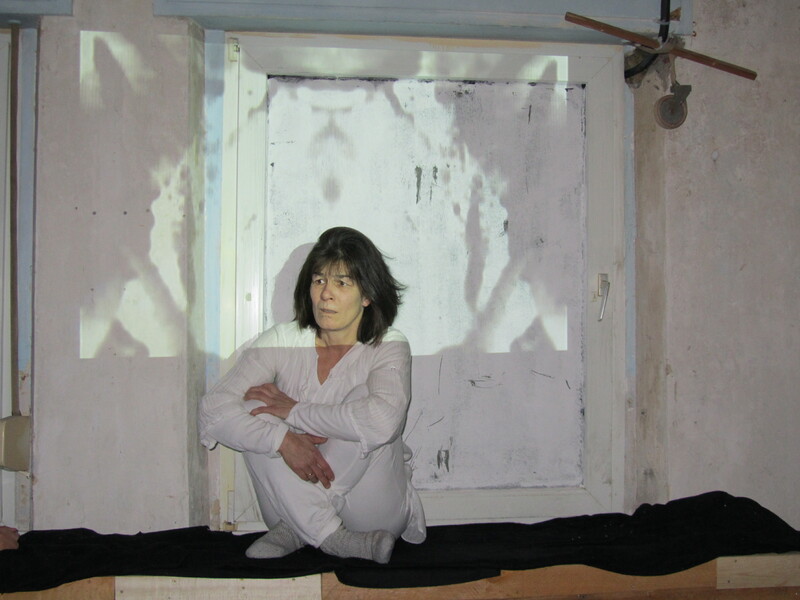 The performance involved three different pieces comprising a forty-five minute program. 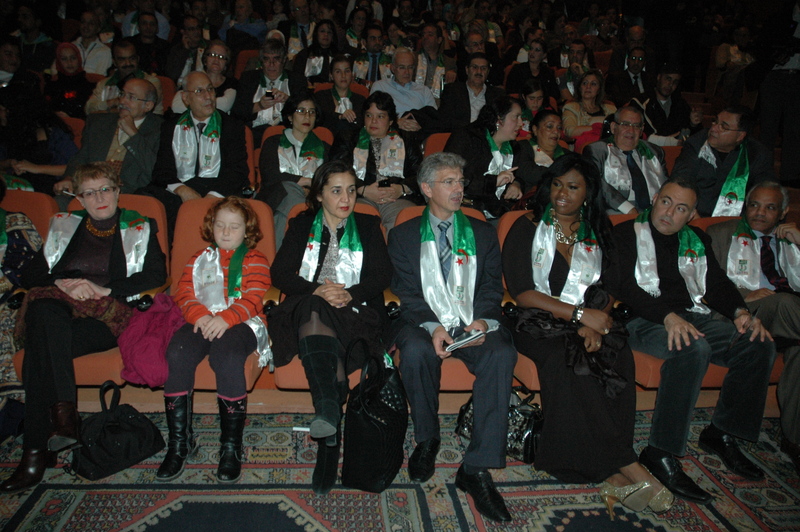 Ambassador Henry S. Ensher attended the program with members of his family along with members of the Algerian cultural ministry. 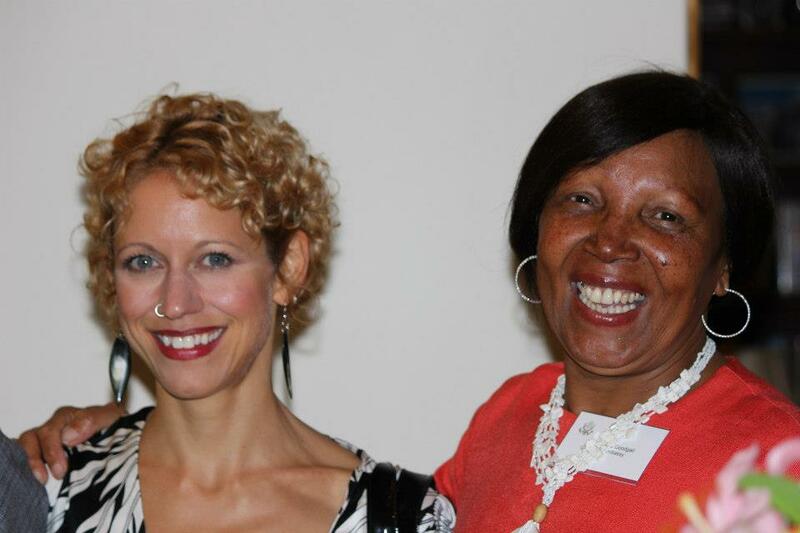 Along with the Ambassador was the Public Affairs Officer, Tashawna Bethea. 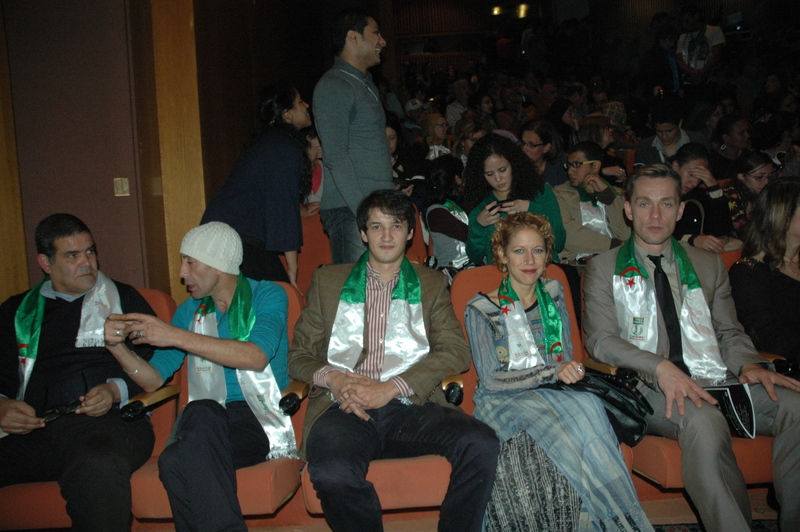 It was anhonor to have them attend the performance and to be honored by the festival with flowers and special mentions. The fact that there was such wide representation and respect for a diverse range of cultures was inspiring. 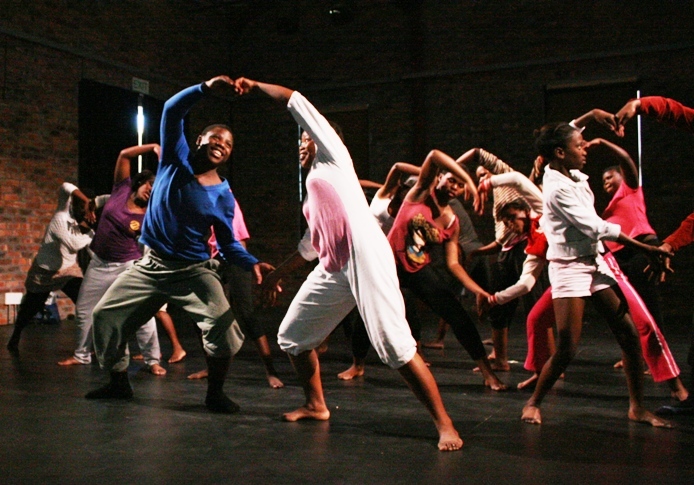 Algieria is one of many North African countries widening the cultural circle and perspective towards contemporary dance. It will be fascinating to watch the dance scene develop it’s own unique identity bridging the Muslim world with current dance trends; a unique style is sure to emerge. Battery Dance hopes to continue its relationship with Algeria and build upon the strong friendship and exchange already in place.